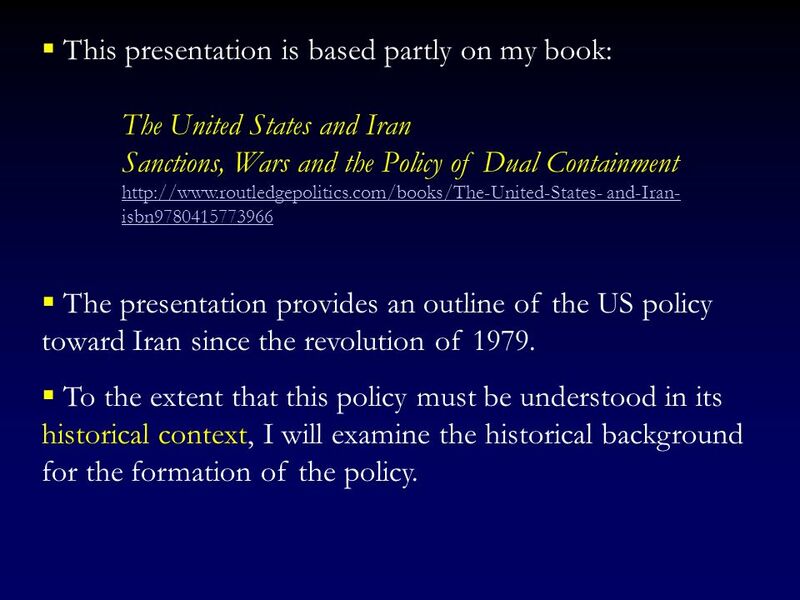 The United States and Iran Sanctions, Wars and the Policy of Dual Containment and-Iran-isbn The presentation provides an outline of the US policy toward Iran since the revolution of 1979. To the extent that this policy must be understood in its historical context, I will examine the historical background for the formation of the policy. 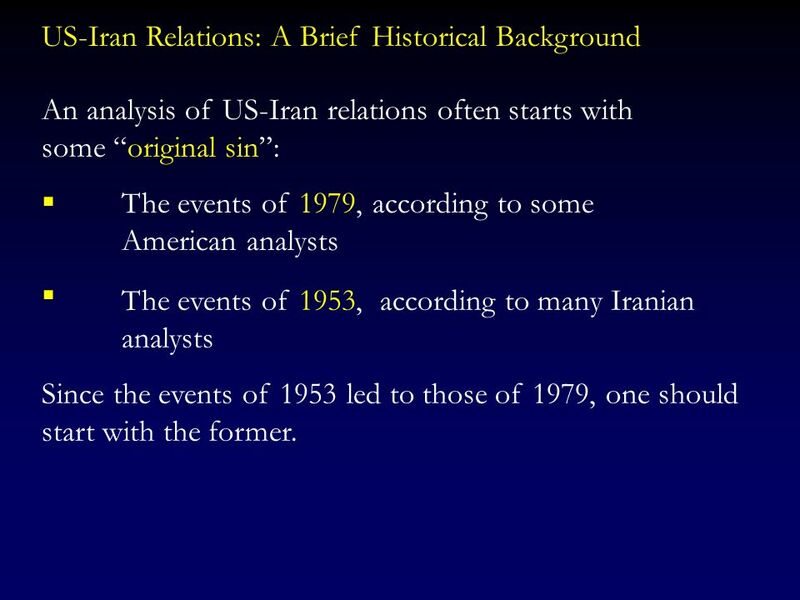 An analysis of US-Iran relations often starts with some “original sin”: The events of 1979, according to some	American analysts The events of 1953, according to many Iranian analysts Since the events of 1953 led to those of 1979, one should start with the former. 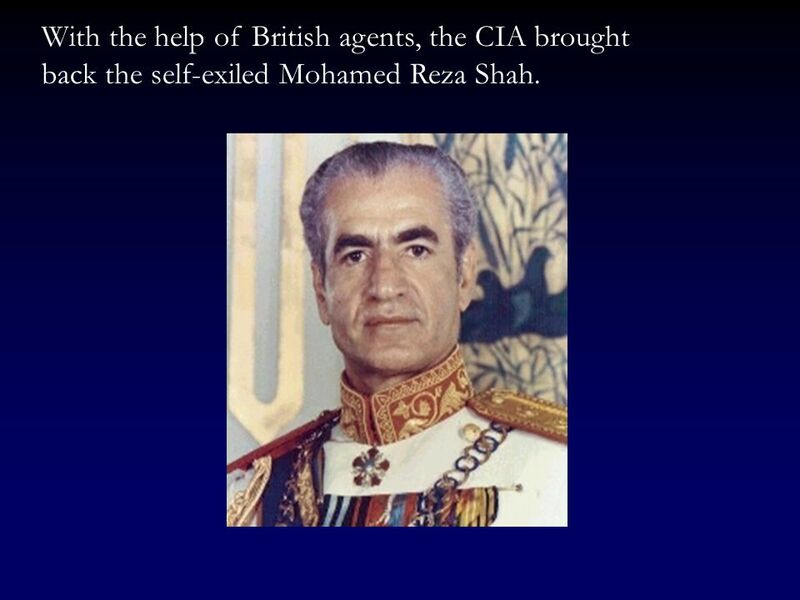 6 With the help of British agents, the CIA brought back the self-exiled Mohamed Reza Shah. 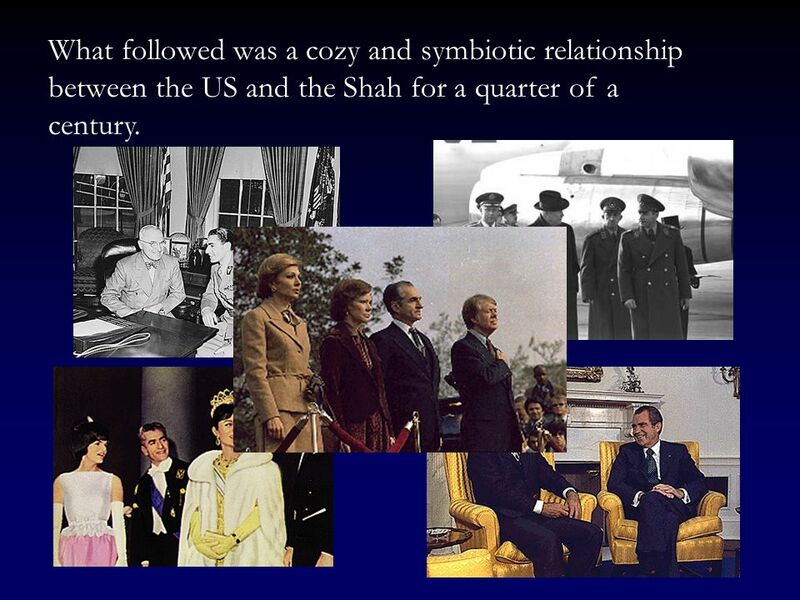 7 What followed was a cozy and symbiotic relationship between the US and the Shah for a quarter of a century. 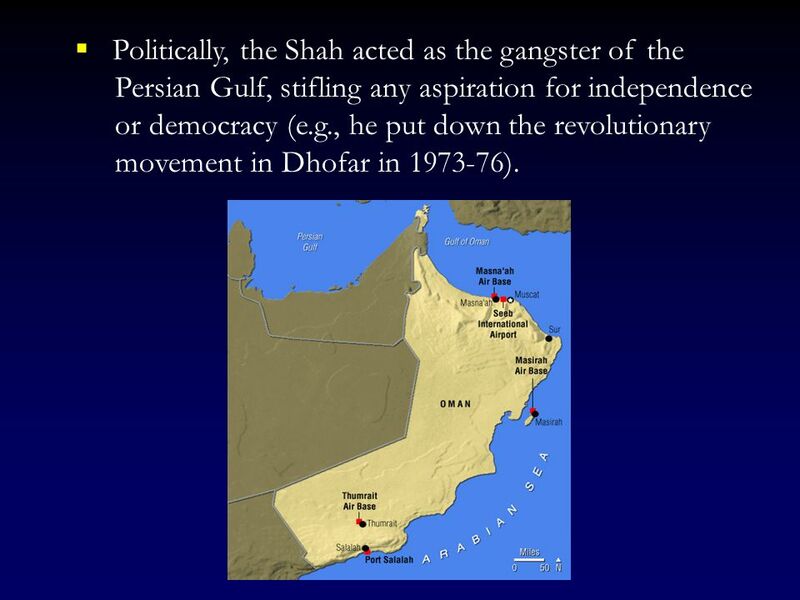 Economically, the Shah maintained the interests of the US corporations, particularly the oil companies, aerospace industry, and financial institutions. 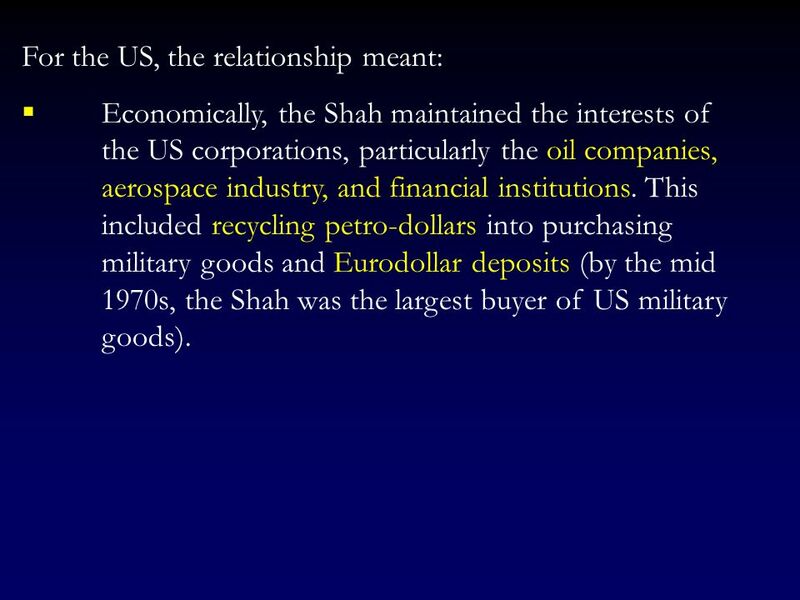 This included recycling petro-dollars into purchasing military goods and Eurodollar deposits (by the mid 1970s, the Shah was the largest buyer of US military goods). 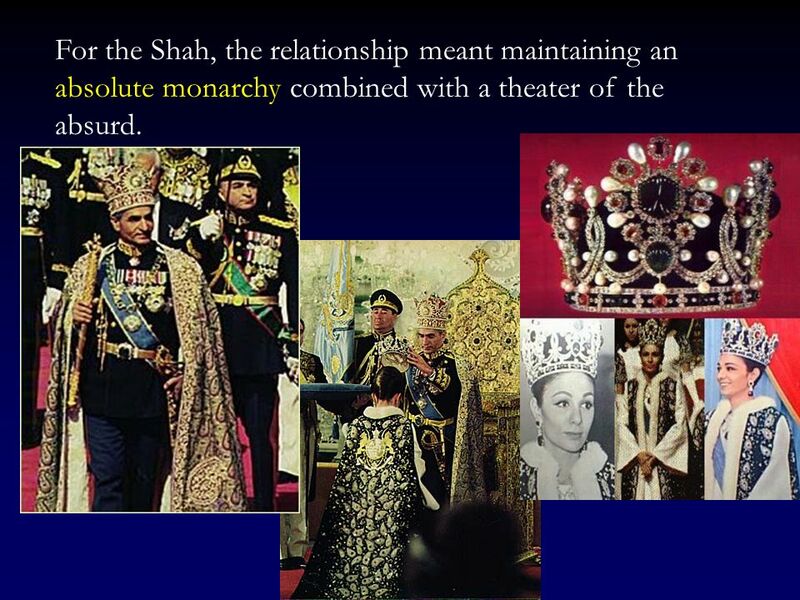 11 For the Shah, the relationship meant maintaining an absolute monarchy combined with a theater of the absurd. An uneven economic development, characterized by corruption, waste, skewed income distribution, and ultimately high rates of unemployment and inflation by the late 1970s. 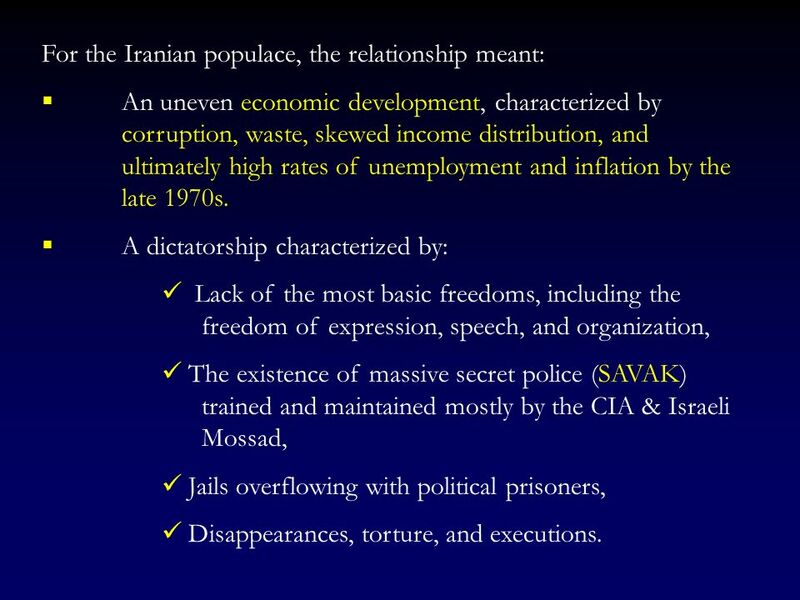 A dictatorship characterized by: Lack of the most basic freedoms, including the freedom of expression, speech, and organization, The existence of massive secret police (SAVAK) trained and maintained mostly by the CIA & Israeli Mossad, Jails overflowing with political prisoners, Disappearances, torture, and executions. 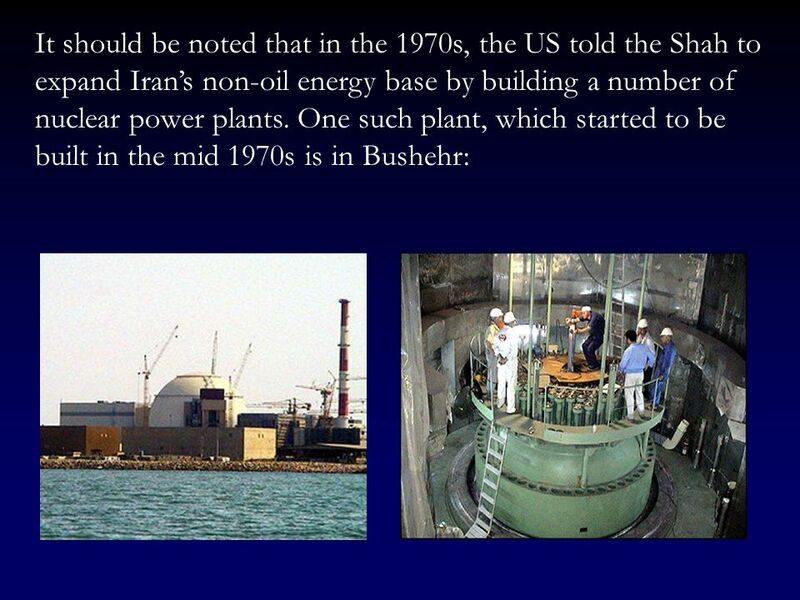 14 “Iran is an island of stability in one of the more troubled areas of the world. This is a great tribute to you, Your Majesty, and to your leadership and to the respect, admiration and love which your people give to you. 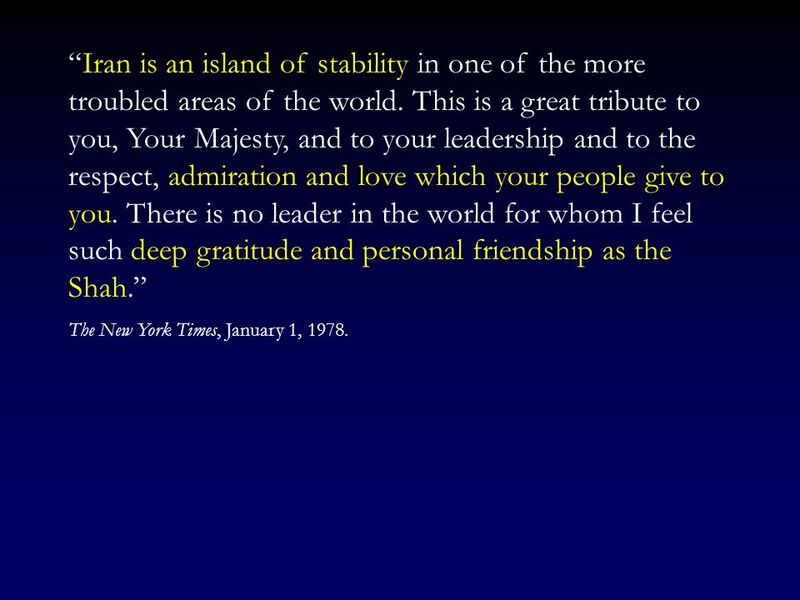 There is no leader in the world for whom I feel such deep gratitude and personal friendship as the Shah.” The New York Times, January 1, 1978. 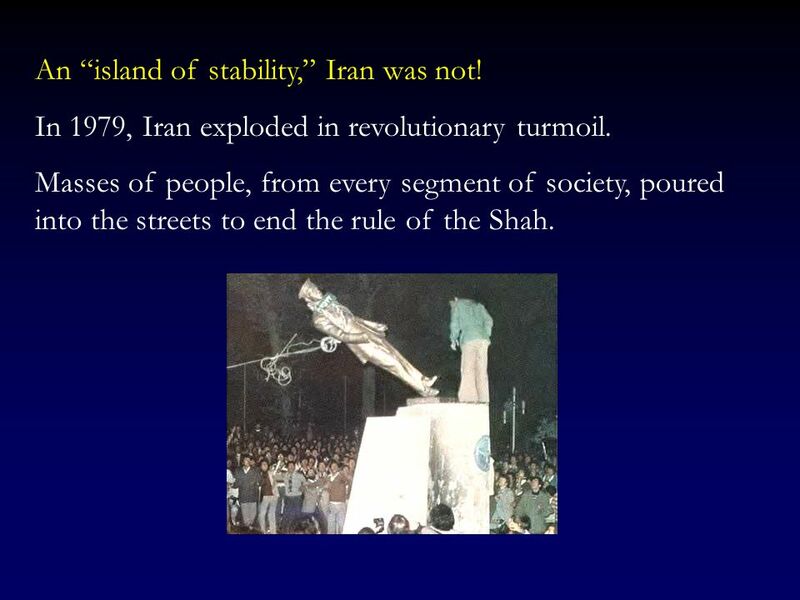 15 An “island of stability,” Iran was not! In 1979, Iran exploded in revolutionary turmoil. Masses of people, from every segment of society, poured into the streets to end the rule of the Shah. 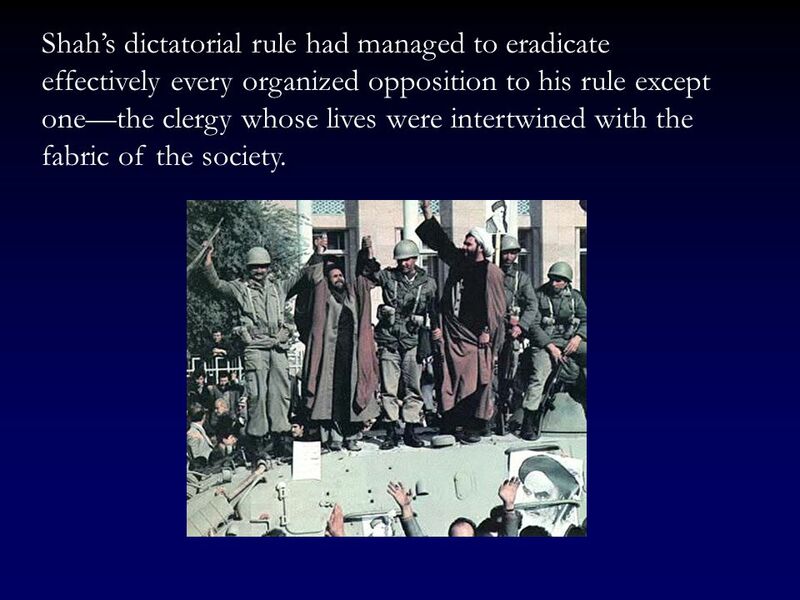 16 Shah’s dictatorial rule had managed to eradicate effectively every organized opposition to his rule except one—the clergy whose lives were intertwined with the fabric of the society. 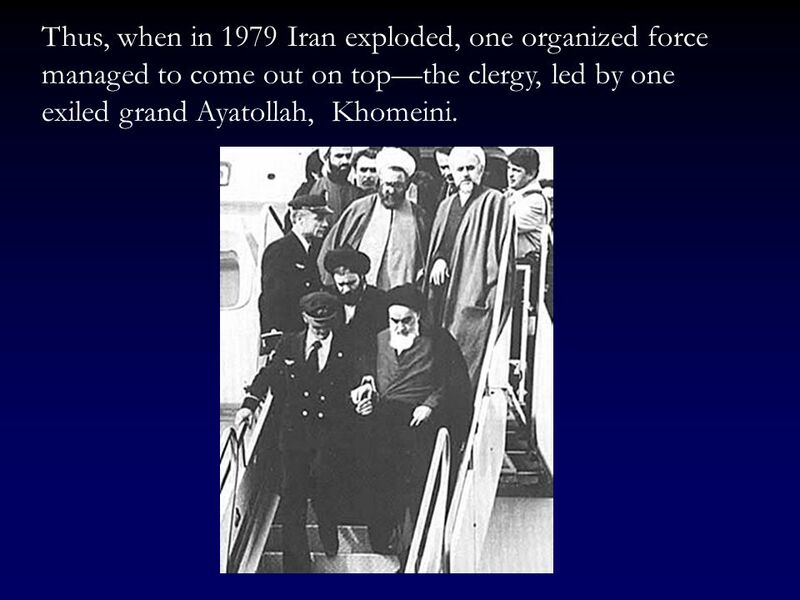 17 Thus, when in 1979 Iran exploded, one organized force managed to come out on top—the clergy, led by one exiled grand Ayatollah, Khomeini. 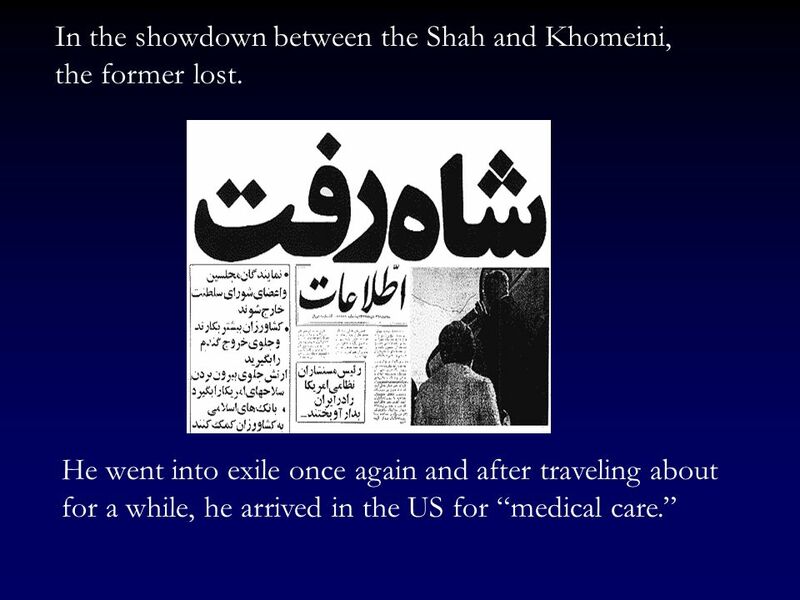 18 In the showdown between the Shah and Khomeini, the former lost. 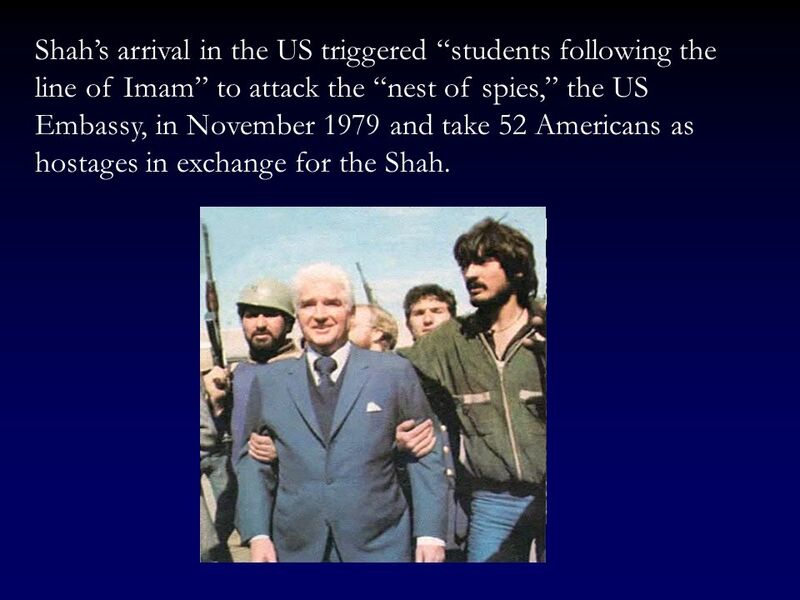 19 Shah’s arrival in the US triggered “students following the line of Imam” to attack the “nest of spies,” the US Embassy, in November 1979 and take 52 Americans as hostages in exchange for the Shah. 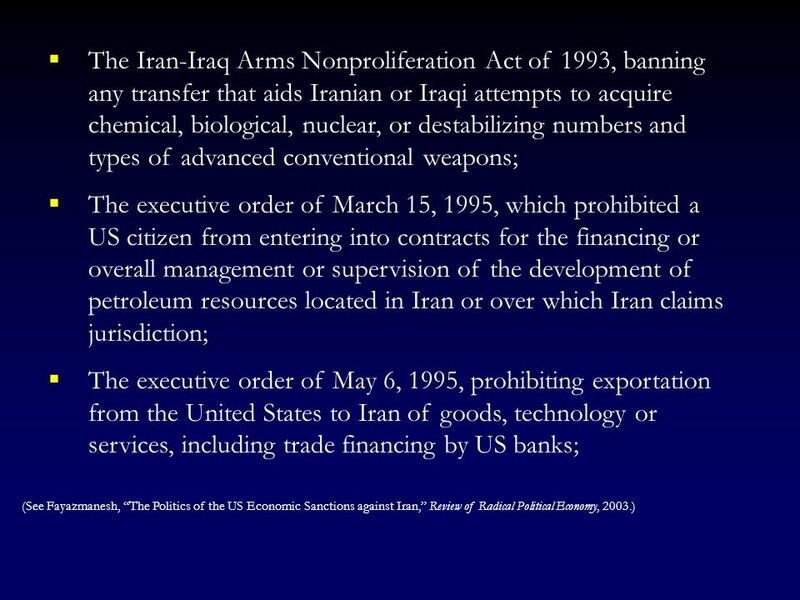 20 A few days after the takeover of the US embassy, the Carter Administration invoked the International Emergency Economic Powers Act (IEEPA) to freeze all Iranian government assets and properties. 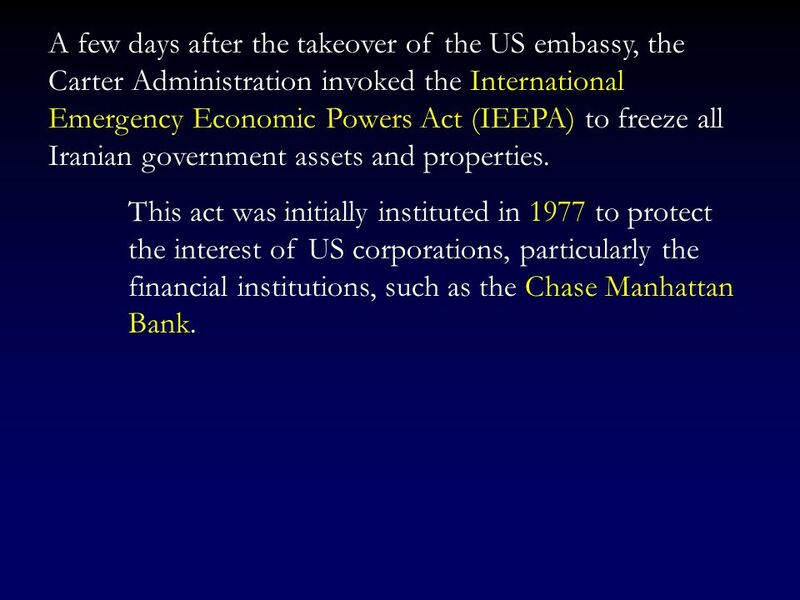 This act was initially instituted in 1977 to protect the interest of US corporations, particularly the financial institutions, such as the Chase Manhattan Bank. 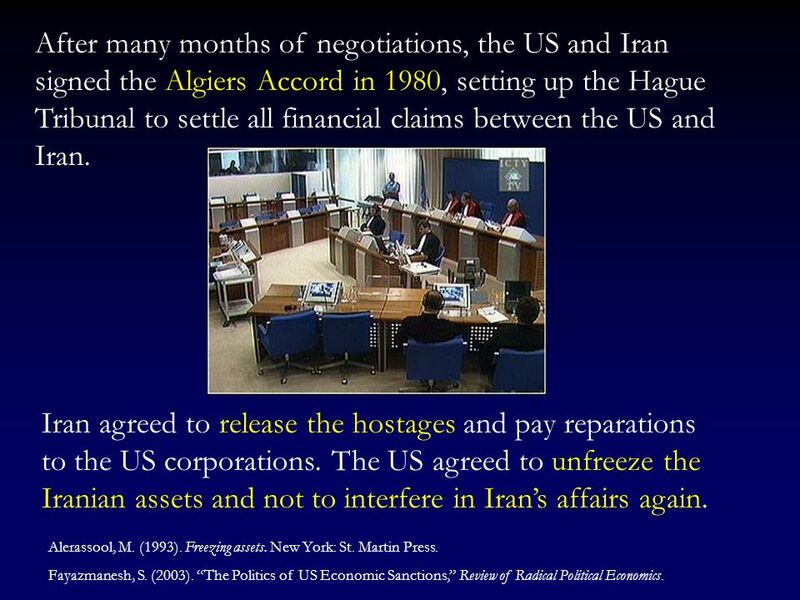 21 After many months of negotiations, the US and Iran signed the Algiers Accord in 1980, setting up the Hague Tribunal to settle all financial claims between the US and Iran. Iran agreed to release the hostages and pay reparations to the US corporations. The US agreed to unfreeze the Iranian assets and not to interfere in Iran’s affairs again. Alerassool, M. (1993). Freezing assets. New York: St. Martin Press. Fayazmanesh, S. (2003). “The Politics of US Economic Sanctions,” Review of Radical Political Economics. 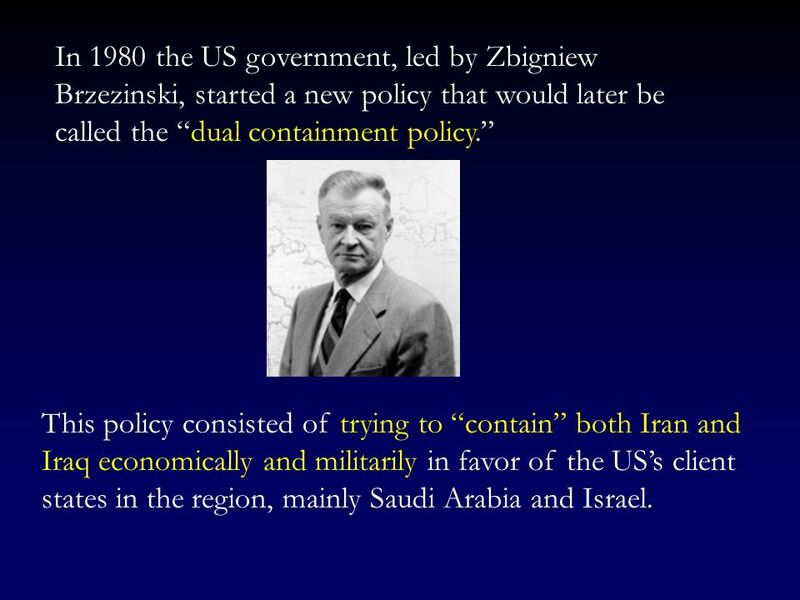 22 In 1980 the US government, led by Zbigniew Brzezinski, started a new policy that would later be called the “dual containment policy.” This policy consisted of trying to “contain” both Iran and Iraq economically and militarily in favor of the US’s client states in the region, mainly Saudi Arabia and Israel. 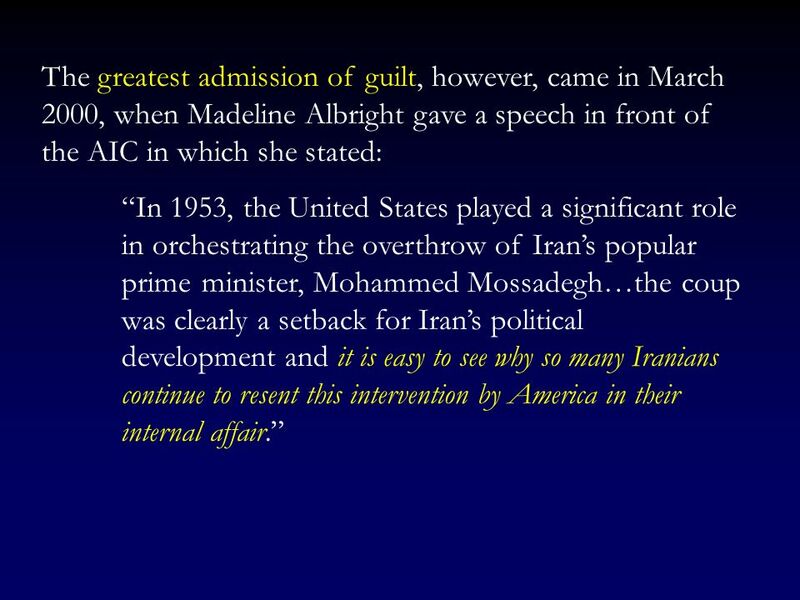 27 Haig: “Both Sadat and Fahd provided other useful intelligence (e.g. 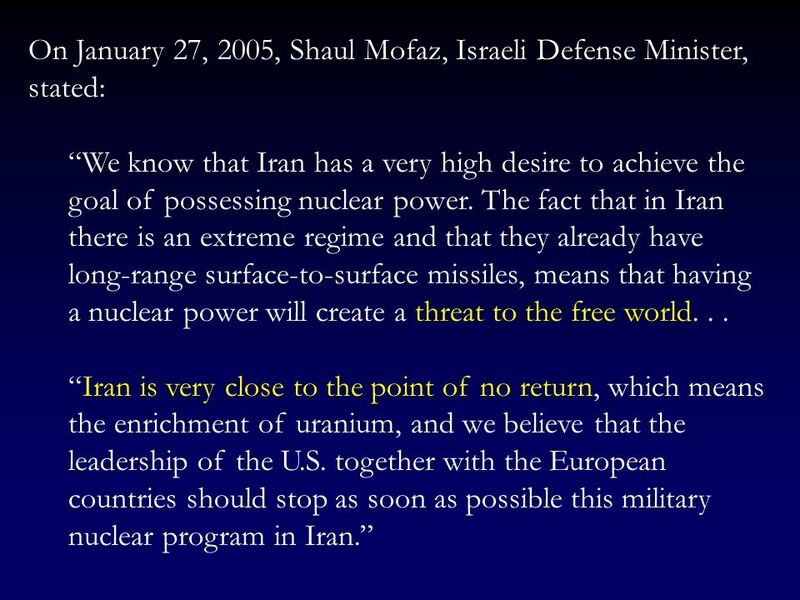 Iran receiving military spares for U.S. equipment from Israel). 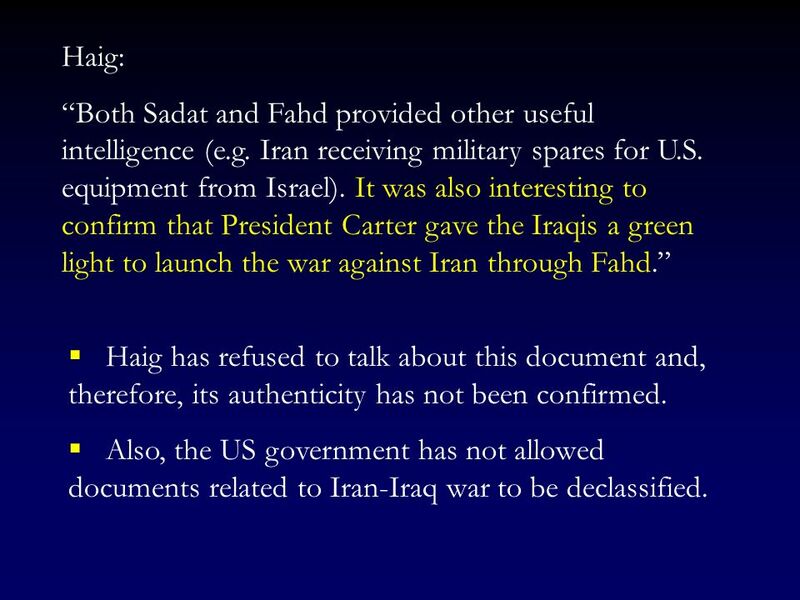 It was also interesting to confirm that President Carter gave the Iraqis a green light to launch the war against Iran through Fahd.” Haig has refused to talk about this document and, therefore, its authenticity has not been confirmed. 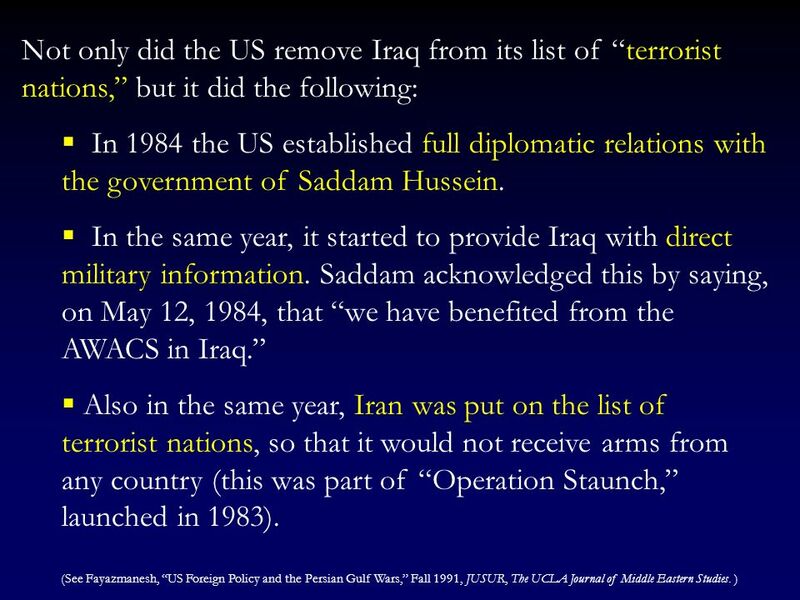 Also, the US government has not allowed documents related to Iran-Iraq war to be declassified. 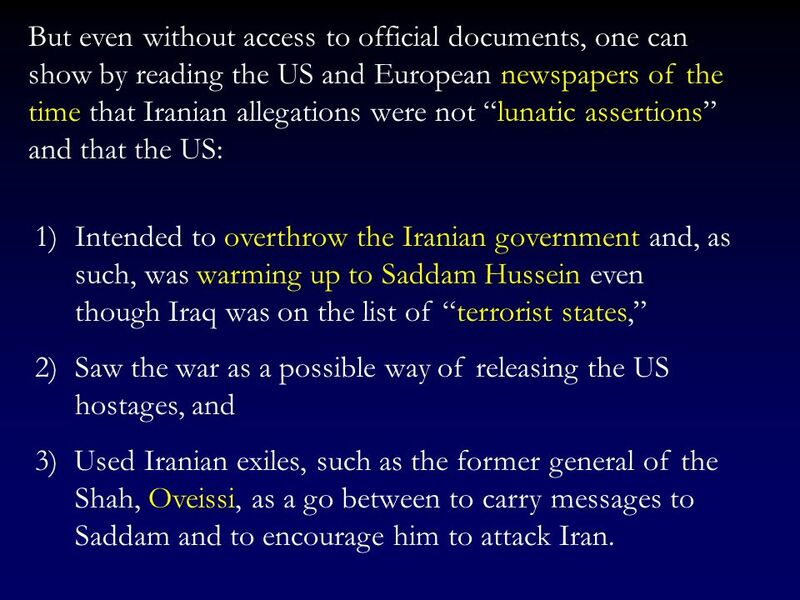 28 But even without access to official documents, one can show by reading the US and European newspapers of the time that Iranian allegations were not “lunatic assertions” and that the US: Intended to overthrow the Iranian government and, as such, was warming up to Saddam Hussein even though Iraq was on the list of “terrorist states,” Saw the war as a possible way of releasing the US hostages, and 3) Used Iranian exiles, such as the former general of the Shah, Oveissi, as a go between to carry messages to Saddam and to encourage him to attack Iran. 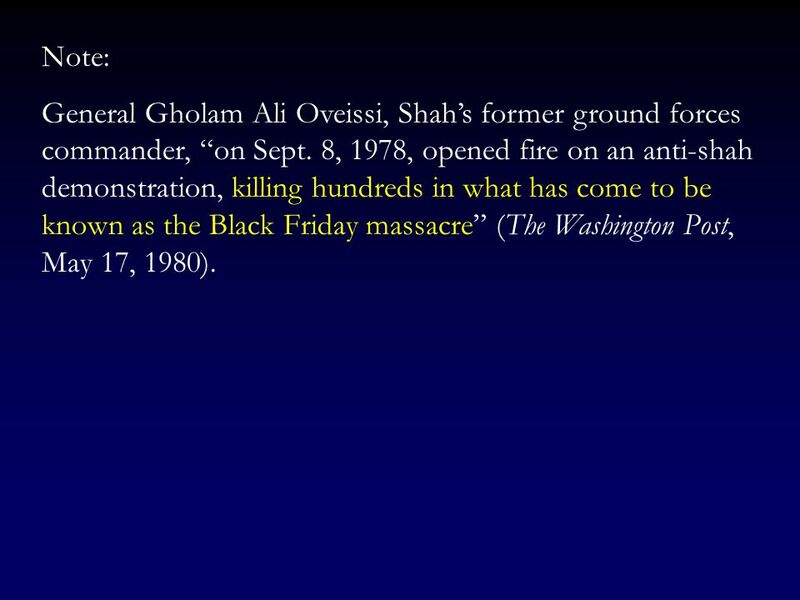 29 Note: General Gholam Ali Oveissi, Shah’s former ground forces commander, “on Sept. 8, 1978, opened fire on an anti-shah demonstration, killing hundreds in what has come to be known as the Black Friday massacre” (The Washington Post, May 17, 1980). 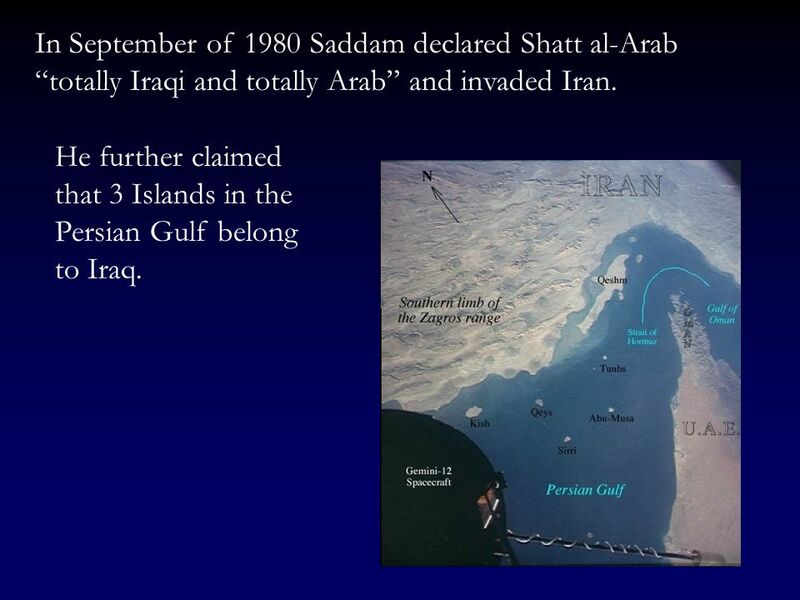 30 In September of 1980 Saddam declared Shatt al-Arab “totally Iraqi and totally Arab” and invaded Iran. 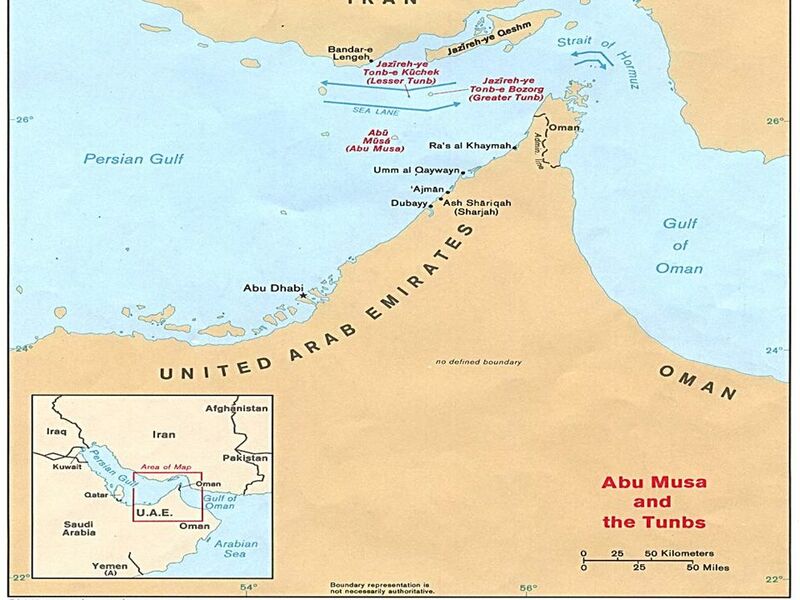 He further claimed that 3 Islands in the Persian Gulf belong to Iraq. 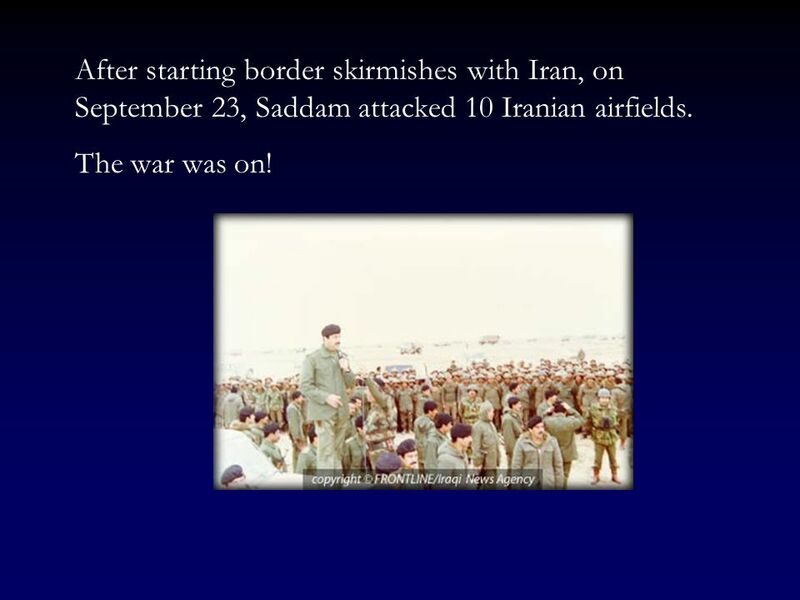 32 After starting border skirmishes with Iran, on September 23, Saddam attacked 10 Iranian airfields. 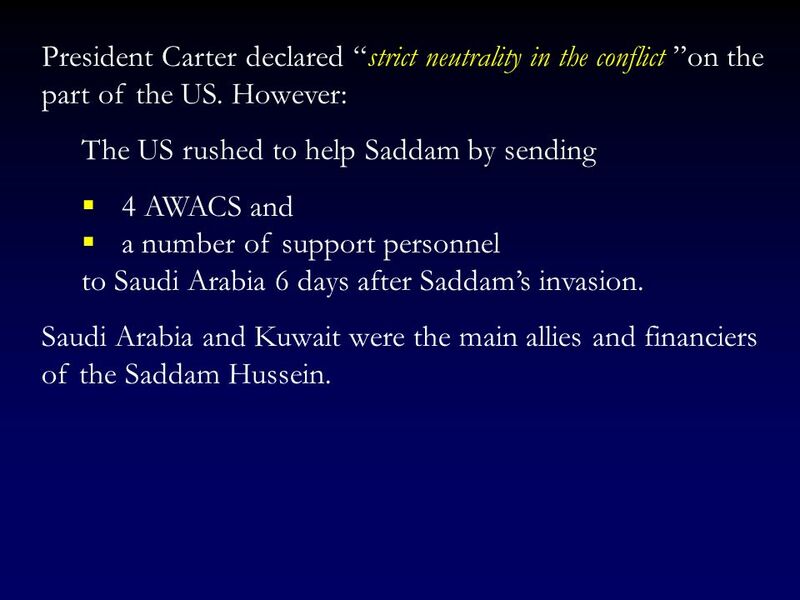 The US rushed to help Saddam by sending 4 AWACS and a number of support personnel to Saudi Arabia 6 days after Saddam’s invasion. 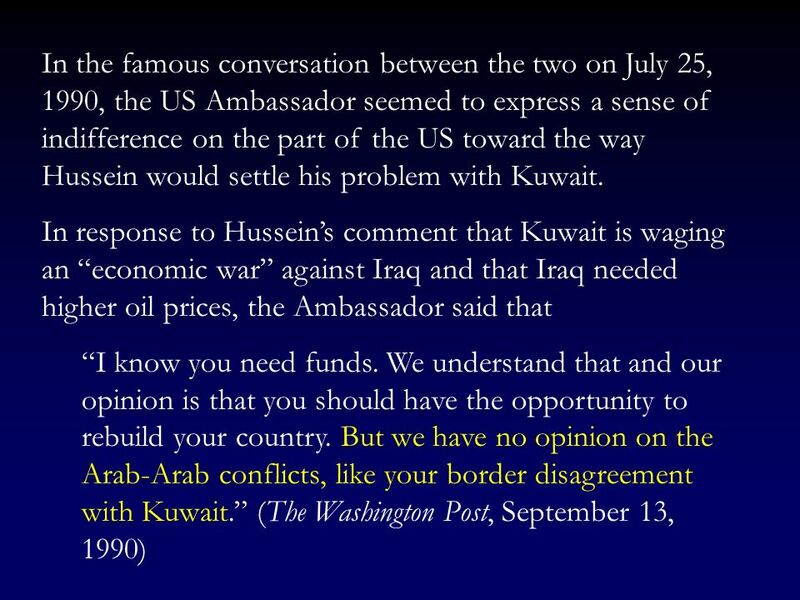 Saudi Arabia and Kuwait were the main allies and financiers of the Saddam Hussein. 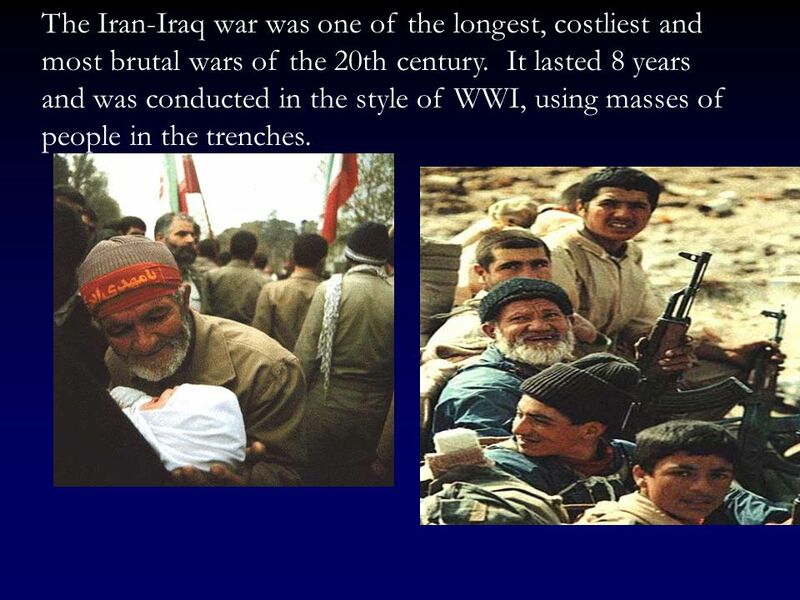 34 The Iran-Iraq war was one of the longest, costliest and most brutal wars of the 20th century. 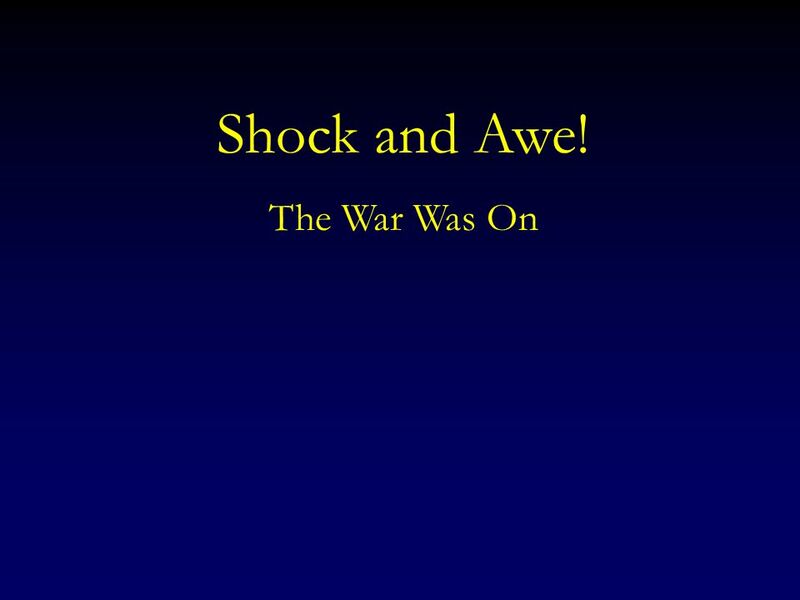 It lasted 8 years and was conducted in the style of WWI, using masses of people in the trenches. 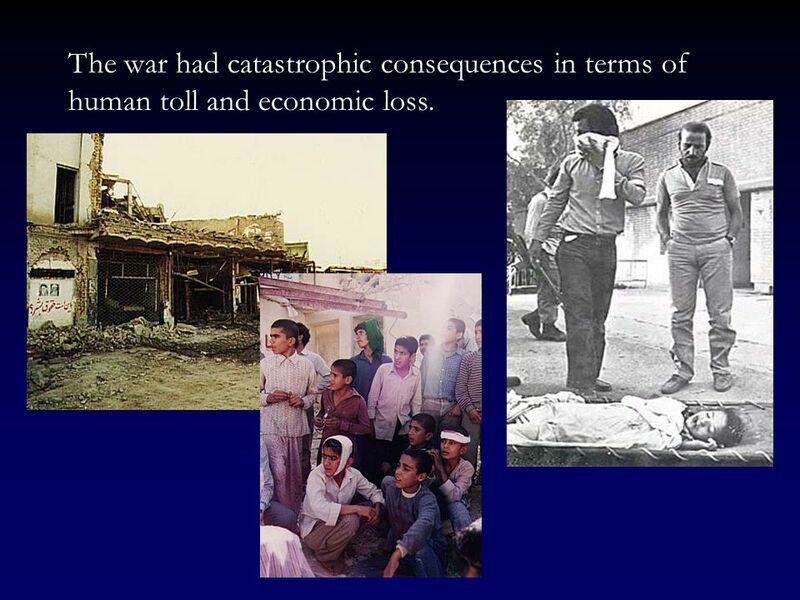 36 The war had catastrophic consequences in terms of human toll and economic loss. 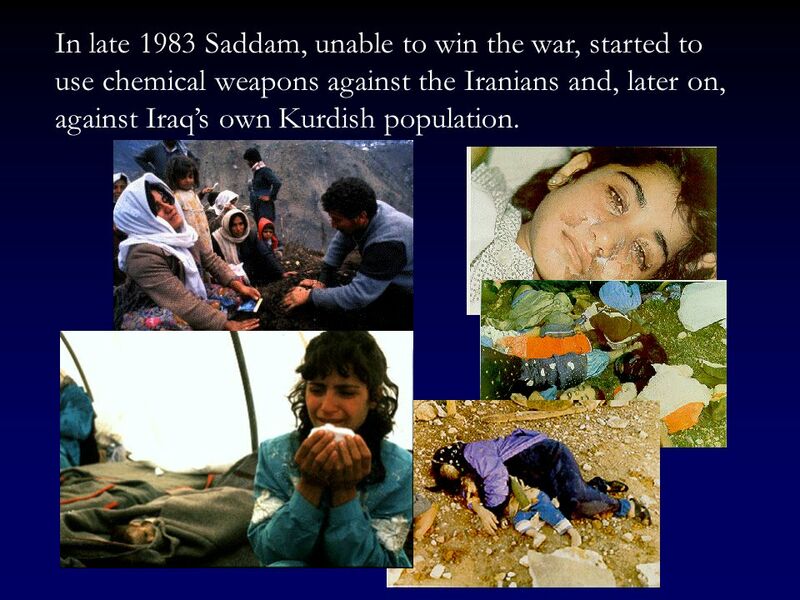 37 In late 1983 Saddam, unable to win the war, started to use chemical weapons against the Iranians and, later on, against Iraq’s own Kurdish population. 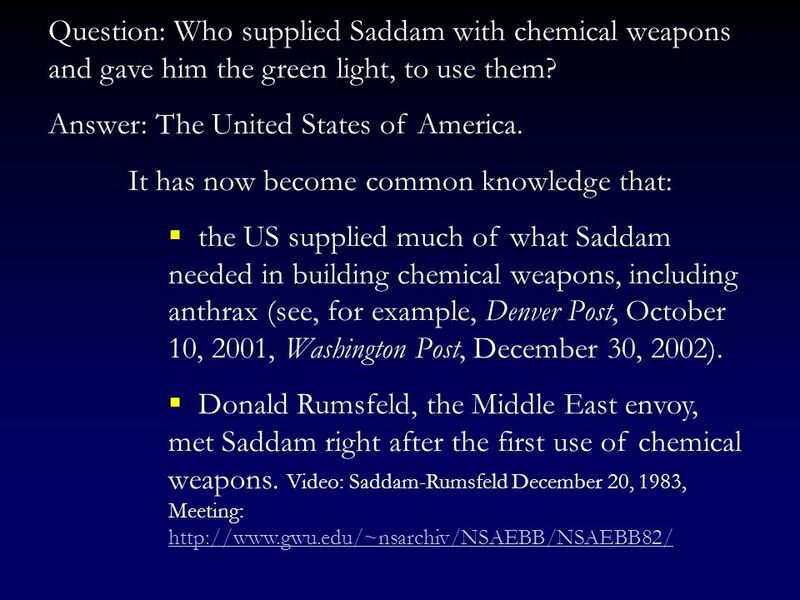 38 Question: Who supplied Saddam with chemical weapons and gave him the green light, to use them? 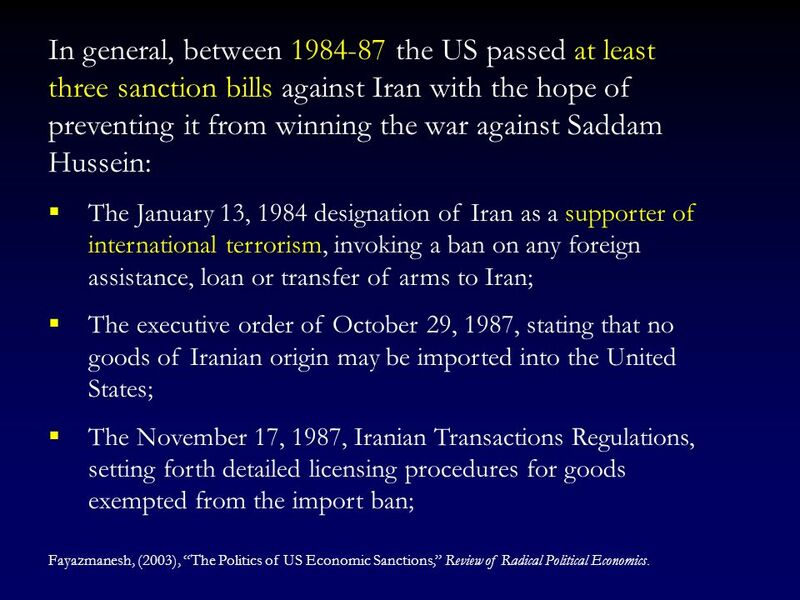 41 In general, between the US passed at least three sanction bills against Iran with the hope of preventing it from winning the war against Saddam Hussein: The January 13, 1984 designation of Iran as a supporter of international terrorism, invoking a ban on any foreign assistance, loan or transfer of arms to Iran; The executive order of October 29, 1987, stating that no goods of Iranian origin may be imported into the United States; The November 17, 1987, Iranian Transactions Regulations, setting forth detailed licensing procedures for goods exempted from the import ban; Fayazmanesh, (2003), “The Politics of US Economic Sanctions,” Review of Radical Political Economics. 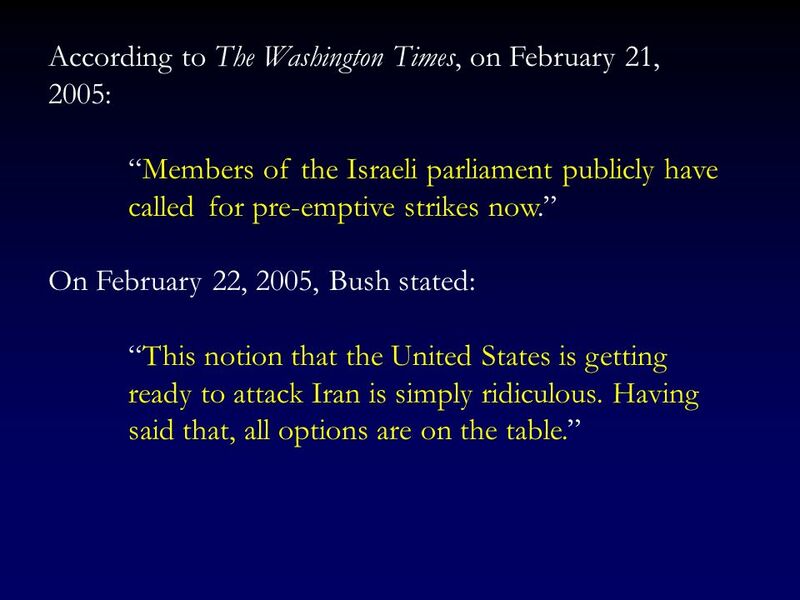 42 Yet, despite all US help, Iraq could not win the war. 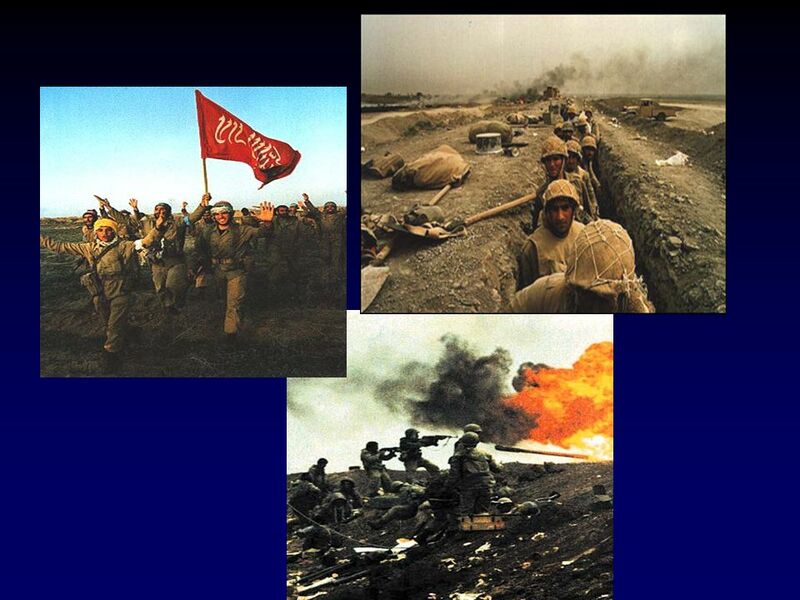 Thus, when in 1986, Iran scored victories in Iraq’s Faw peninsula, the US engaged Iran directly. 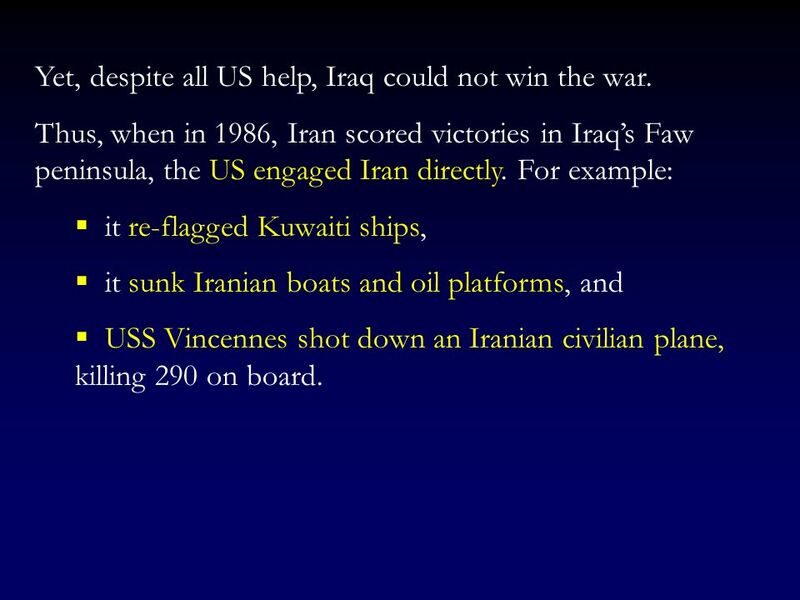 For example: it re-flagged Kuwaiti ships, it sunk Iranian boats and oil platforms, and USS Vincennes shot down an Iranian civilian plane, killing 290 on board. 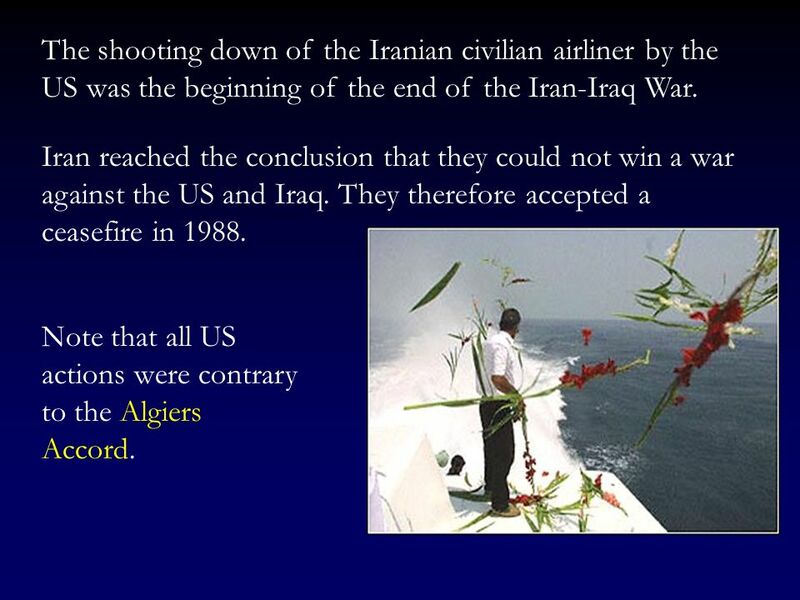 43 The shooting down of the Iranian civilian airliner by the US was the beginning of the end of the Iran-Iraq War. 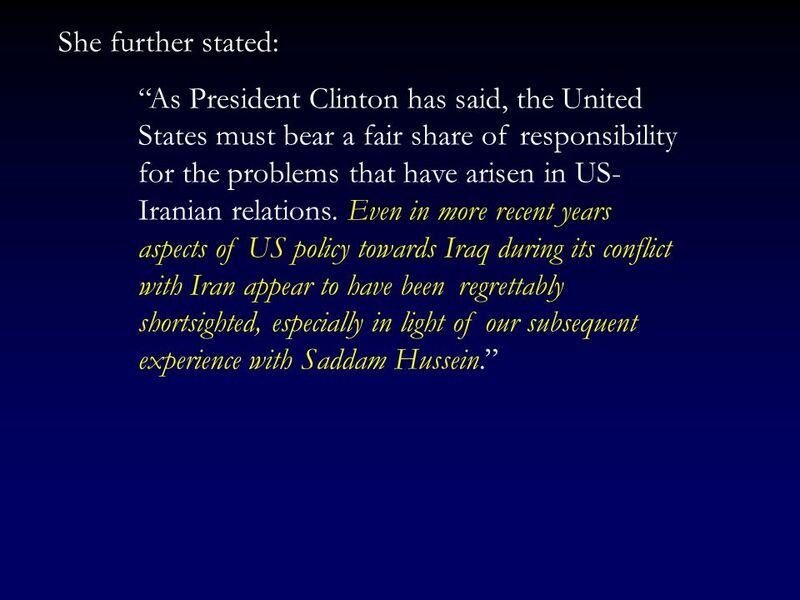 Iran reached the conclusion that they could not win a war against the US and Iraq. 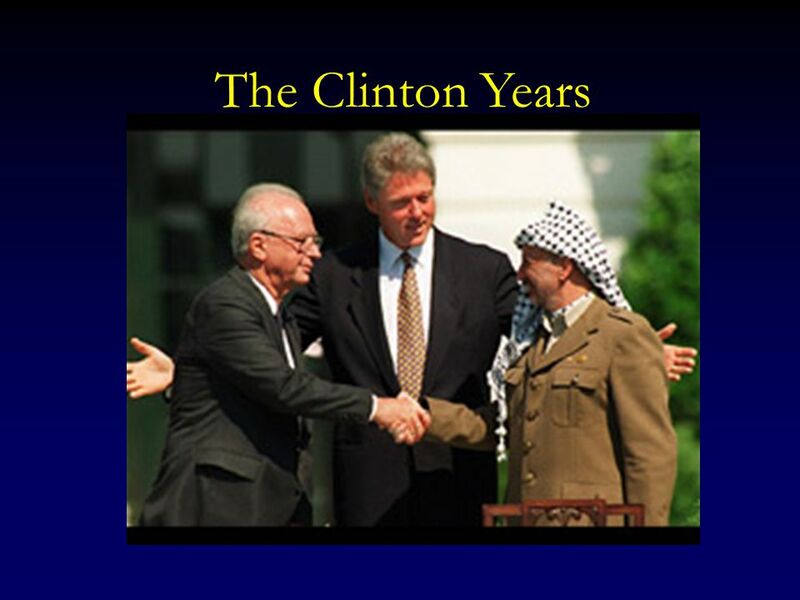 They therefore accepted a ceasefire in 1988. 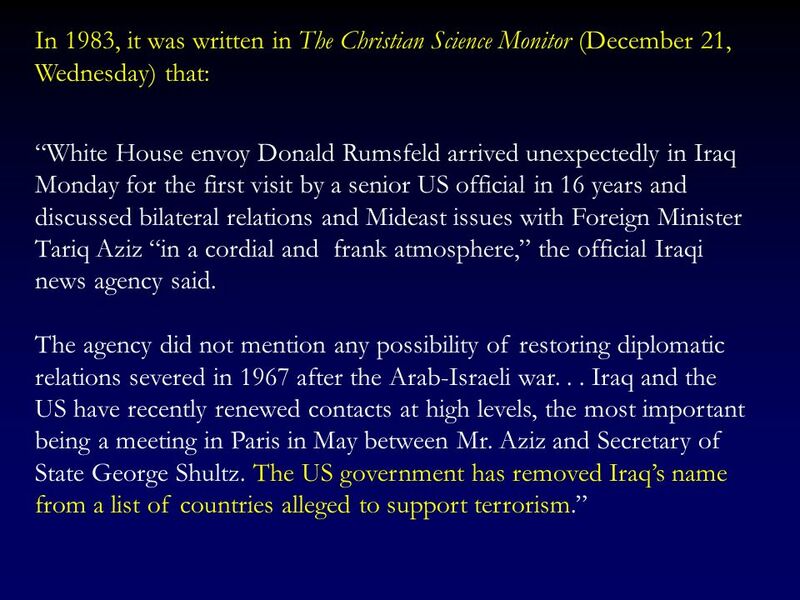 Note that all US actions were contrary to the Algiers Accord. 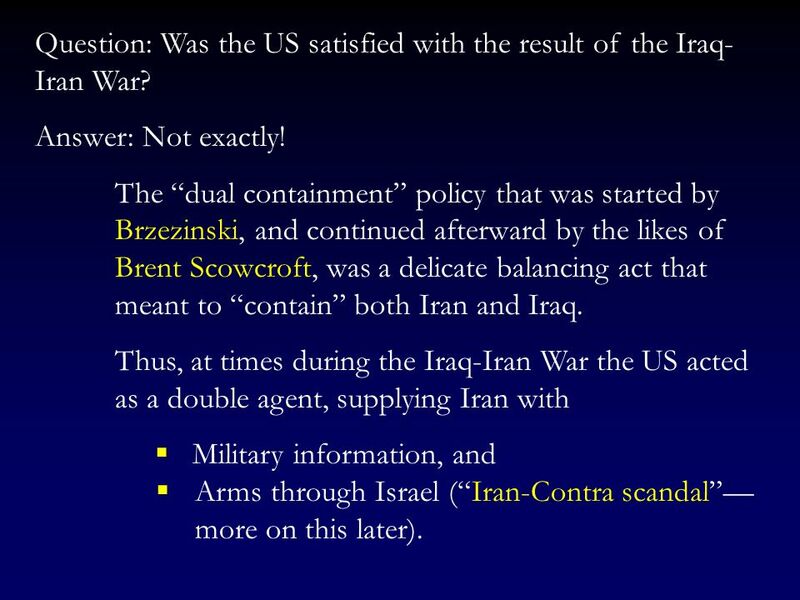 44 Question: Was the US satisfied with the result of the Iraq-Iran War? Answer: Not exactly! 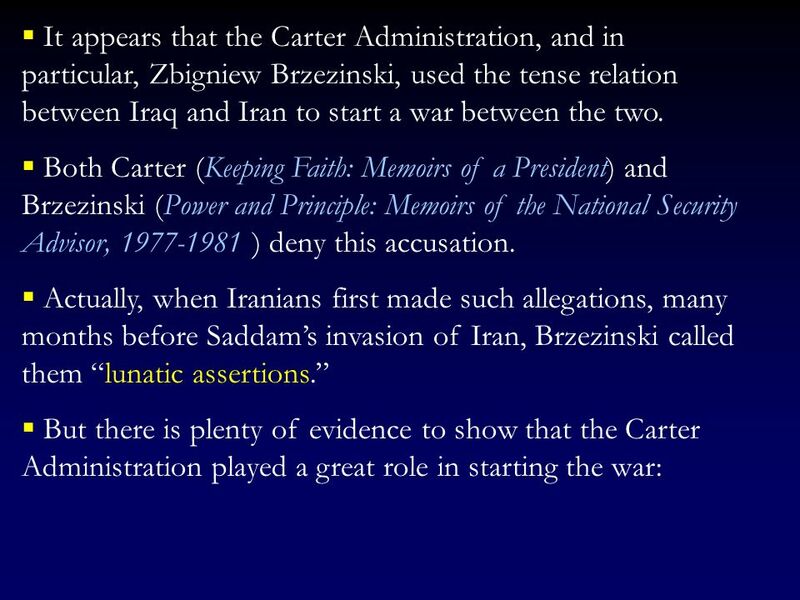 The “dual containment” policy that was started by Brzezinski, and continued afterward by the likes of Brent Scowcroft, was a delicate balancing act that meant to “contain” both Iran and Iraq. 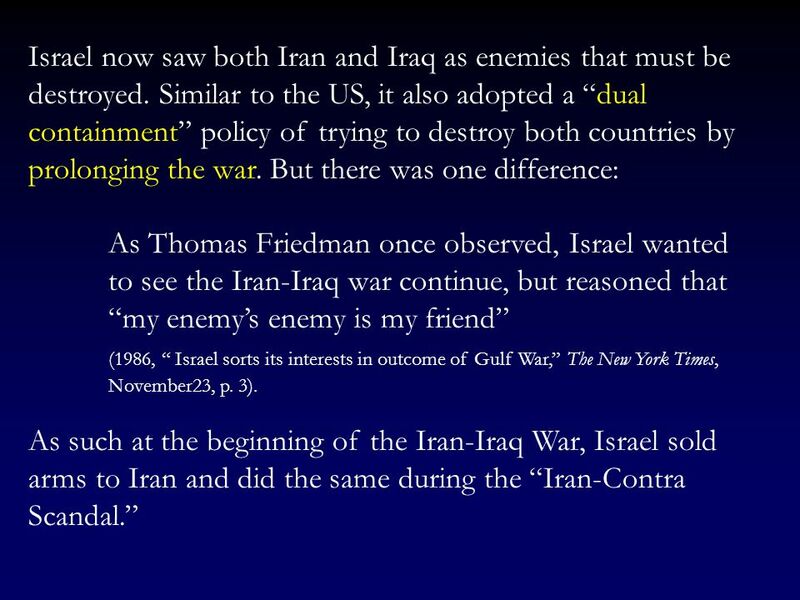 Thus, at times during the Iraq-Iran War the US acted as a double agent, supplying Iran with Military information, and Arms through Israel (“Iran-Contra scandal”— more on this later). 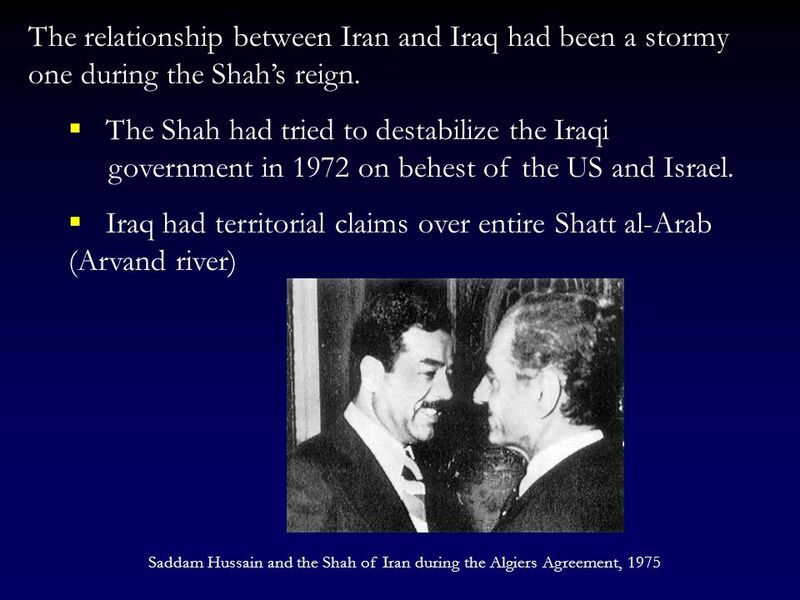 47 The Role of Israel As mentioned earlier, similar to the US, Israel had a symbiotic relationship with the Shah as well. 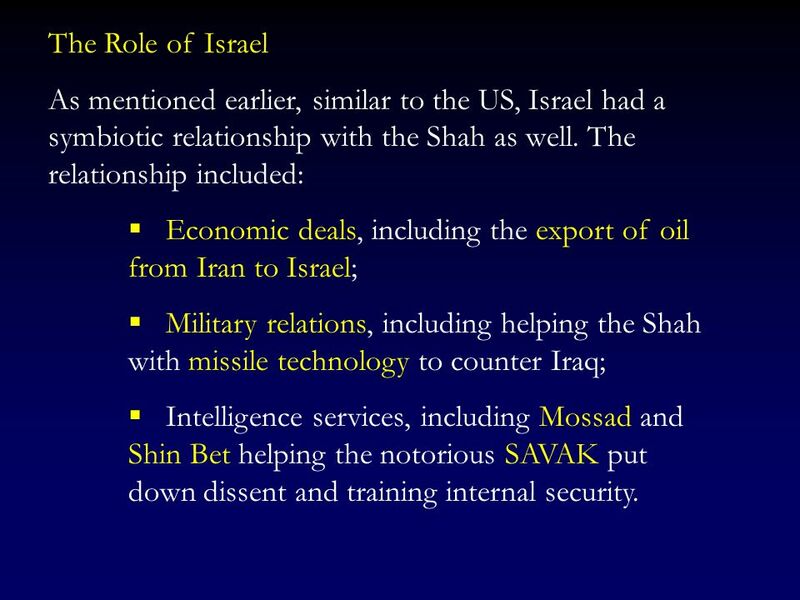 The relationship included: Economic deals, including the export of oil from Iran to Israel; Military relations, including helping the Shah with missile technology to counter Iraq; Intelligence services, including Mossad and Shin Bet helping the notorious SAVAK put down dissent and training internal security. 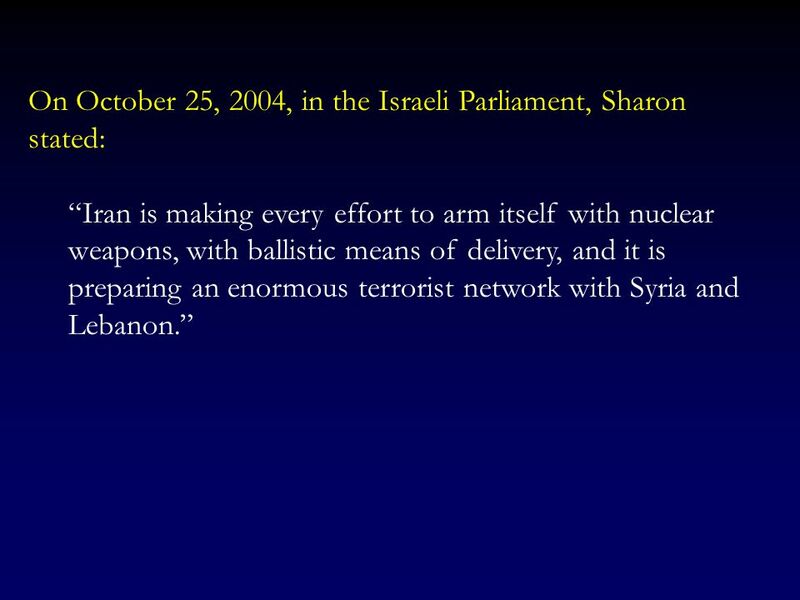 48 Indeed, the last representative of Israel to Iran (1978), Uri Lubrani, was the former head of Israeli security service Shin Bet. 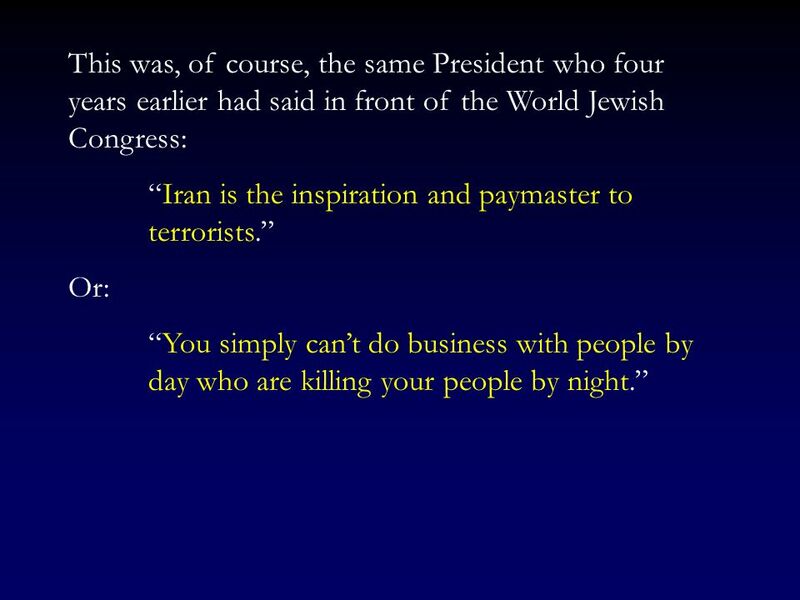 (See Samuel Segev, 1988, The Iranian Triangle: The Untold Story of Israel’s Role in the Iran-Contra Affair, Free Press, p. 107). 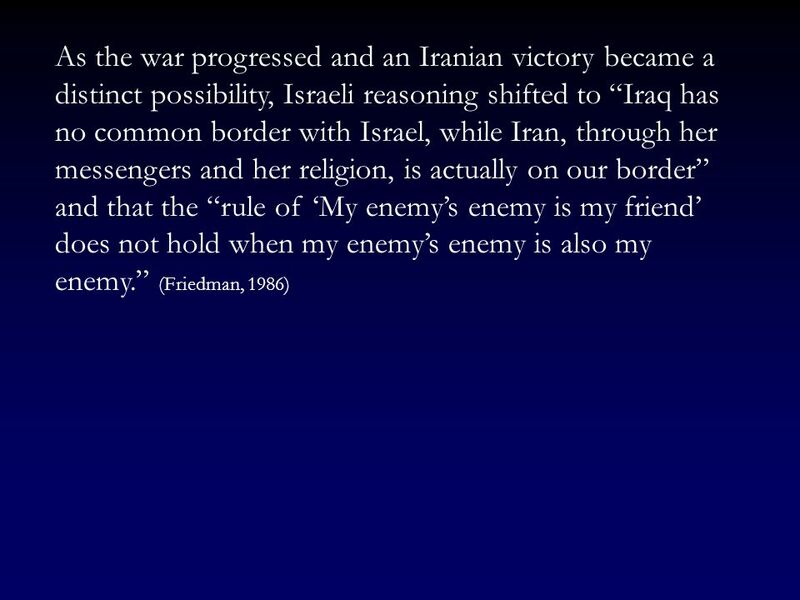 (On the relation between Israel and the Shah and the policy of the “alliance of the periphery” see also Avi Shlaim, 2000, The Iron Wall: Israel and the Arab World, New York: W.W. Norton & Company). 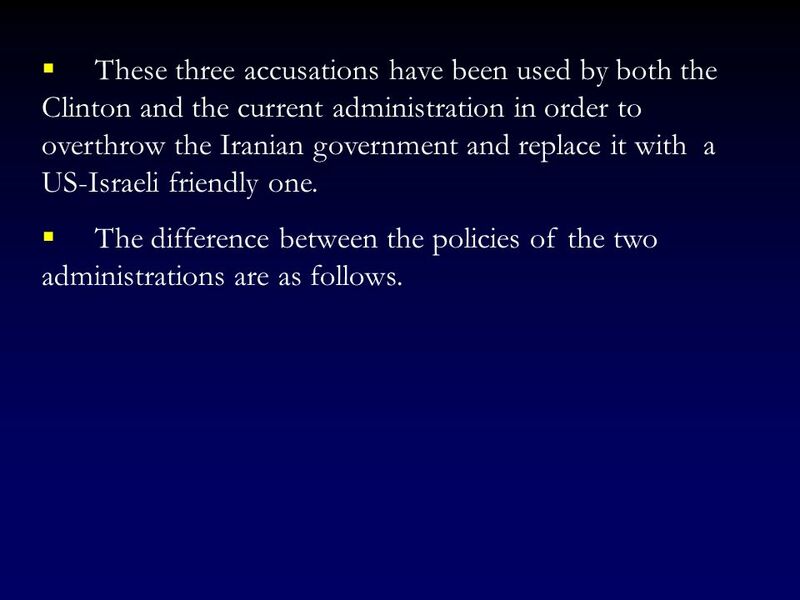 49 There were, however, certain differences between the Shah’s relation with the US and Israel. 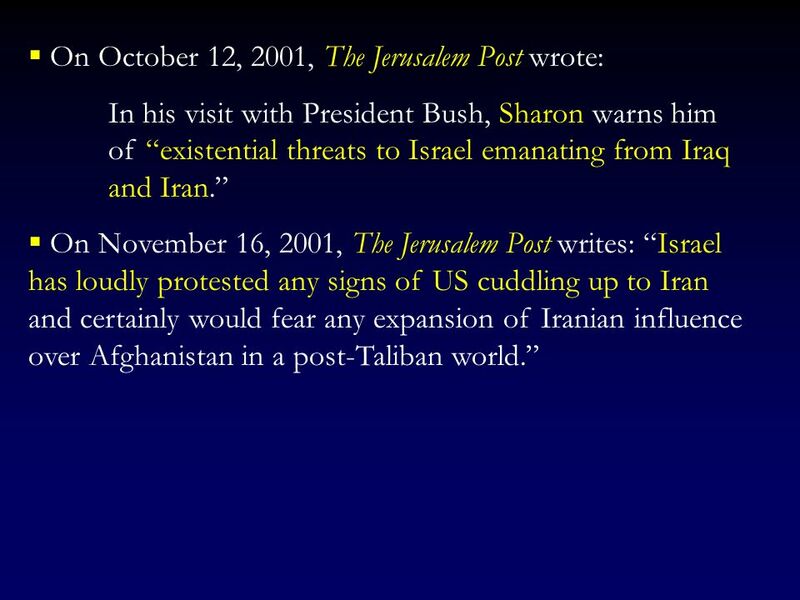 For example, The Shah had an open relation with the US. 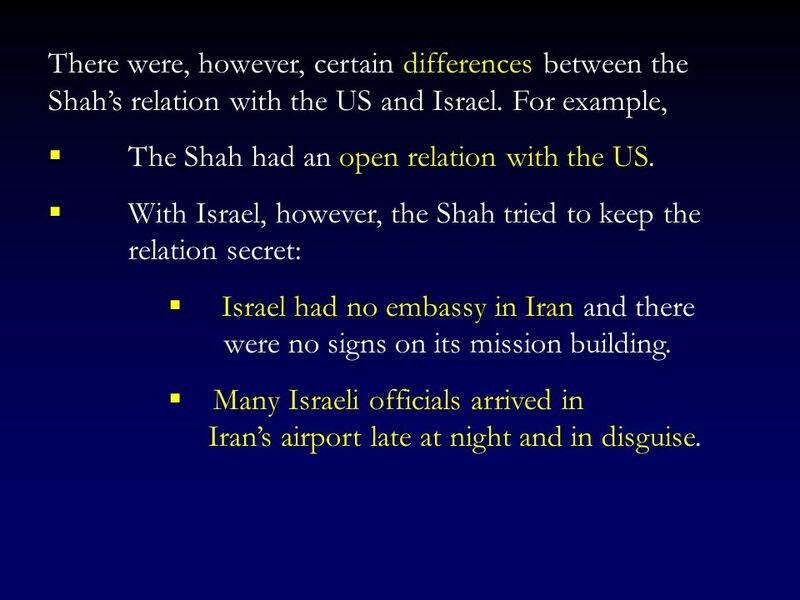 With Israel, however, the Shah tried to keep the relation secret: Israel had no embassy in Iran and there	were no signs on its mission building. Many Israeli officials arrived in Iran’s airport late at night and in disguise. 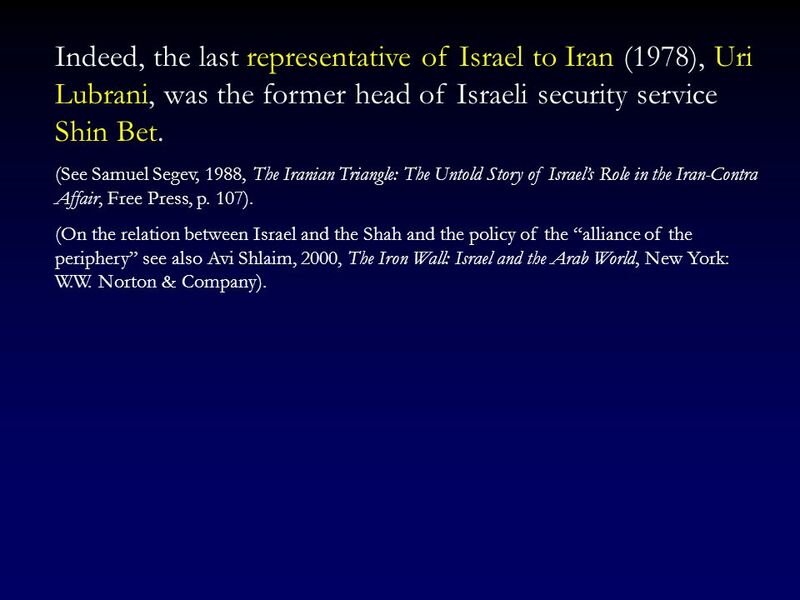 50 Many Iranians, however, knew of the close relation between the Shah and Israel and despised the Israeli support for the Shah’s rule. This resentment came into the open on a number of occasions. 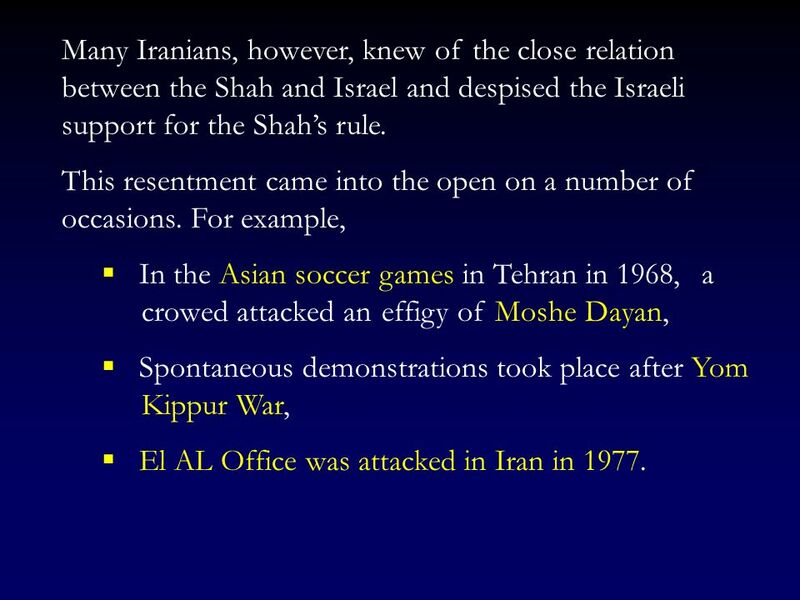 For example, In the Asian soccer games in Tehran in 1968, a crowed attacked an effigy of Moshe Dayan, Spontaneous demonstrations took place after Yom Kippur War, El AL Office was attacked in Iran in 1977. 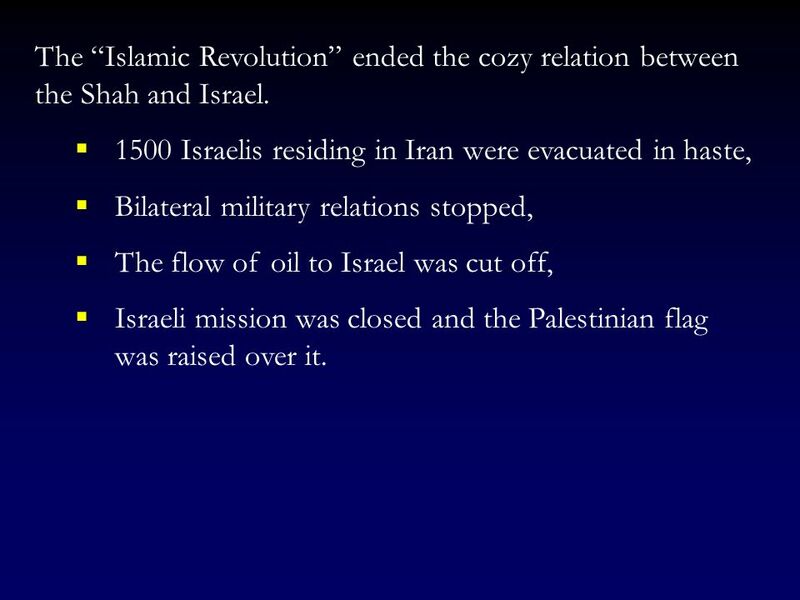 51 The “Islamic Revolution” ended the cozy relation between the Shah and Israel. 1500 Israelis residing in Iran were evacuated in haste, Bilateral military relations stopped, The flow of oil to Israel was cut off, Israeli mission was closed and the Palestinian flag was raised over it. 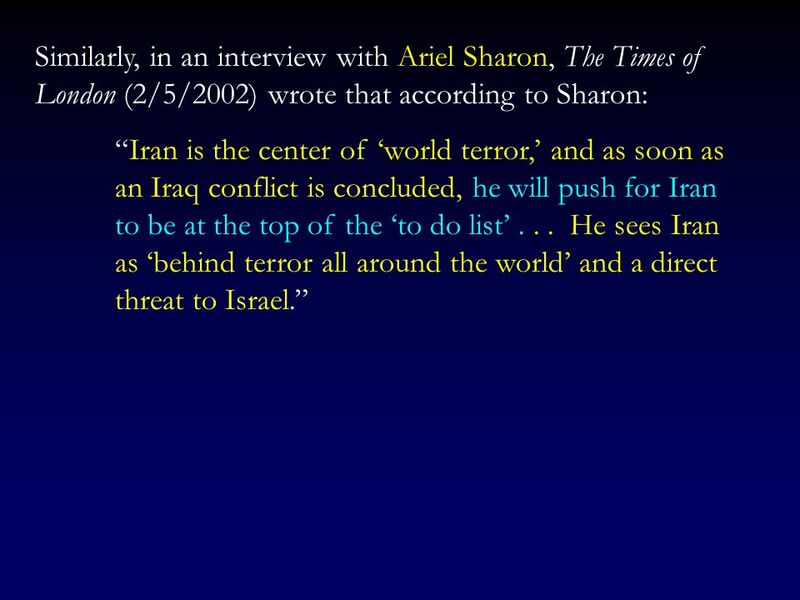 54 With the conclusion of the Iran-Iraq war, the first US invasion of Iraq and destruction of the country, Israel turned its attention mostly to overthrowing the Iranian government. 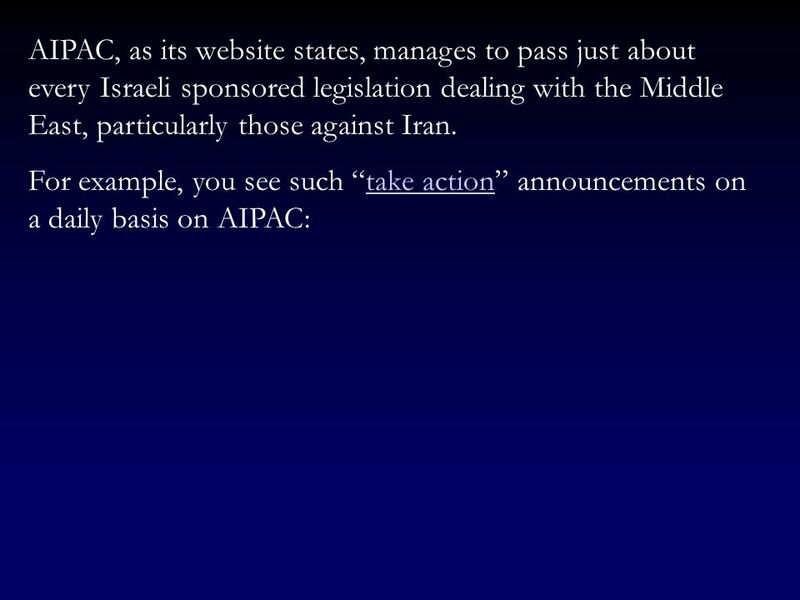 In addition to direct cooperation with the US, Israel used its powerful lobbies, such as The American Israel Public Affairs Committee (AIPAC) to underwrite US foreign policy in the Middle East. 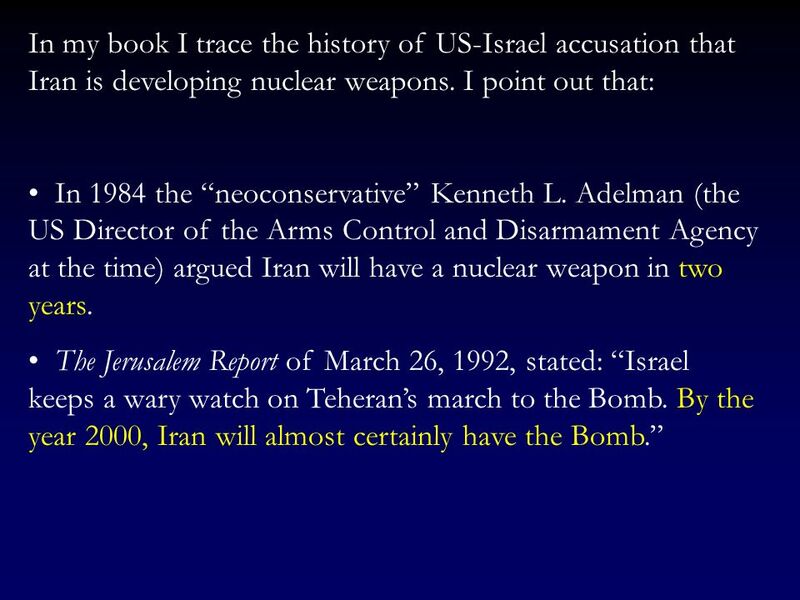 On AIPAC see: Edward Tivnan, 1987, The Lobby, New York: Simon and Schuster, John Mearsheimer and Stephen Walt, 2007, The Israel Lobby and US Foreign Policy, New York: Farrar, Straus and Giroux. 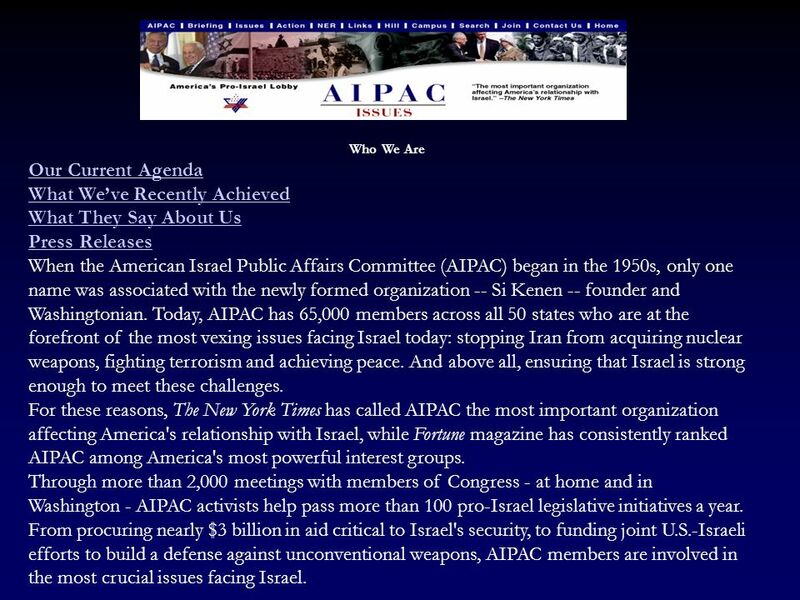 55 Who We Are Our Current Agenda What We’ve Recently Achieved What They Say About Us Press Releases When the American Israel Public Affairs Committee (AIPAC) began in the 1950s, only one name was associated with the newly formed organization -- Si Kenen -- founder and Washingtonian. Today, AIPAC has 65,000 members across all 50 states who are at the forefront of the most vexing issues facing Israel today: stopping Iran from acquiring nuclear weapons, fighting terrorism and achieving peace. And above all, ensuring that Israel is strong enough to meet these challenges. 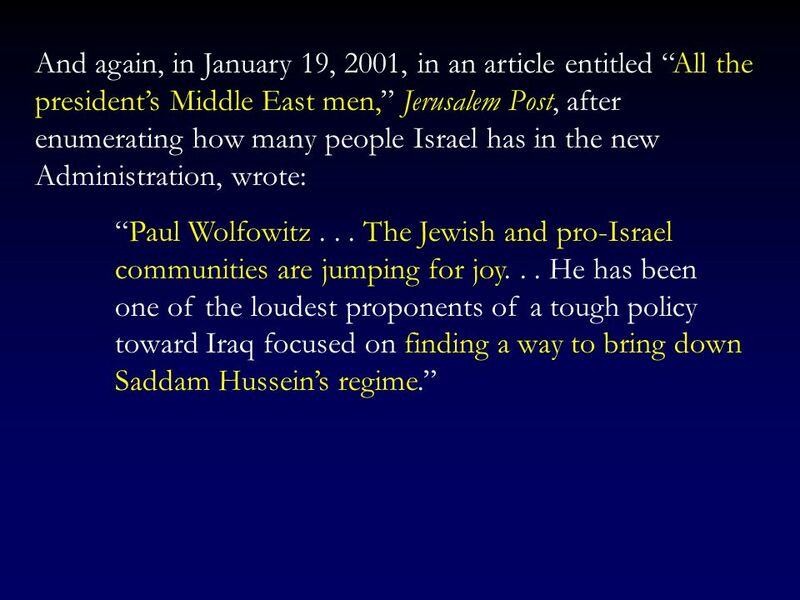 For these reasons, The New York Times has called AIPAC the most important organization affecting America's relationship with Israel, while Fortune magazine has consistently ranked AIPAC among America's most powerful interest groups. Through more than 2,000 meetings with members of Congress - at home and in Washington - AIPAC activists help pass more than 100 pro-Israel legislative initiatives a year. From procuring nearly $3 billion in aid critical to Israel's security, to funding joint U.S.-Israeli efforts to build a defense against unconventional weapons, AIPAC members are involved in the most crucial issues facing Israel. 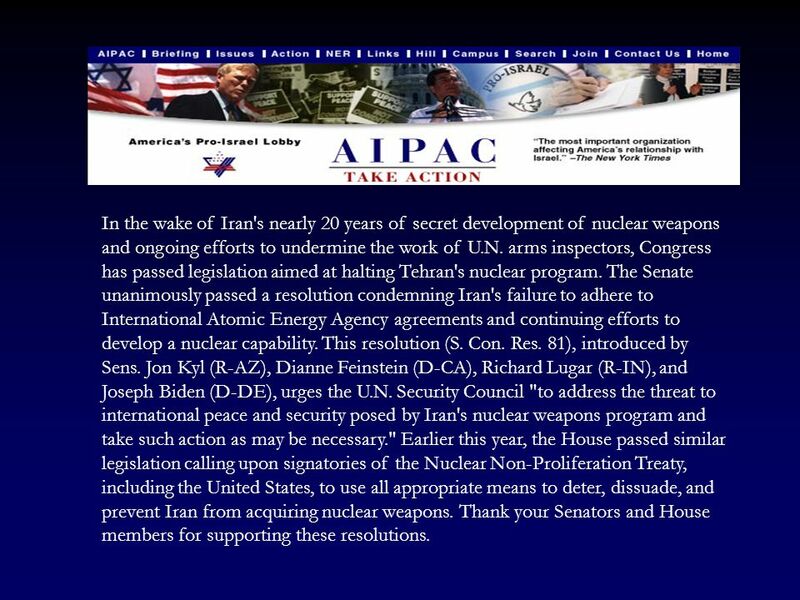 57 In the wake of Iran's nearly 20 years of secret development of nuclear weapons and ongoing efforts to undermine the work of U.N. arms inspectors, Congress has passed legislation aimed at halting Tehran's nuclear program. The Senate unanimously passed a resolution condemning Iran's failure to adhere to International Atomic Energy Agency agreements and continuing efforts to develop a nuclear capability. This resolution (S. Con. Res. 81), introduced by Sens. Jon Kyl (R-AZ), Dianne Feinstein (D-CA), Richard Lugar (R-IN), and Joseph Biden (D-DE), urges the U.N. Security Council "to address the threat to international peace and security posed by Iran's nuclear weapons program and take such action as may be necessary." 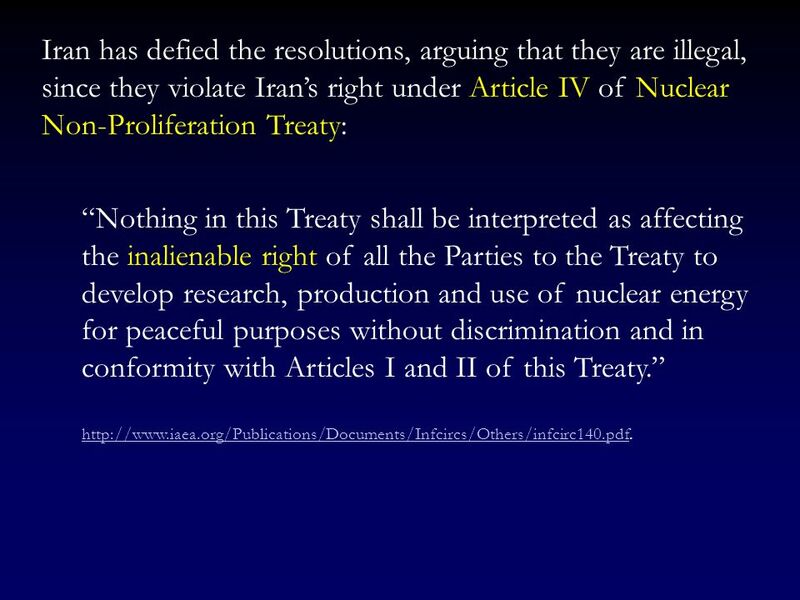 Earlier this year, the House passed similar legislation calling upon signatories of the Nuclear Non-Proliferation Treaty, including the United States, to use all appropriate means to deter, dissuade, and prevent Iran from acquiring nuclear weapons. Thank your Senators and House members for supporting these resolutions. 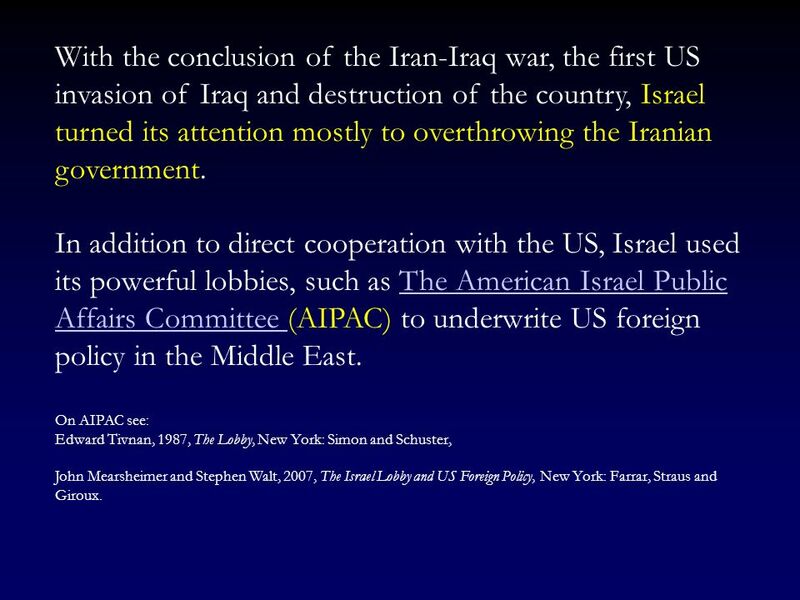 58 Note: In late August 2004 FBI discovered a spy network in the Department of Defense (under Paul Wolfowitz and Douglas Feith) which passed confidential documents on Iran to AIPAC and from there to Israel But nothing happened to AIPAC. 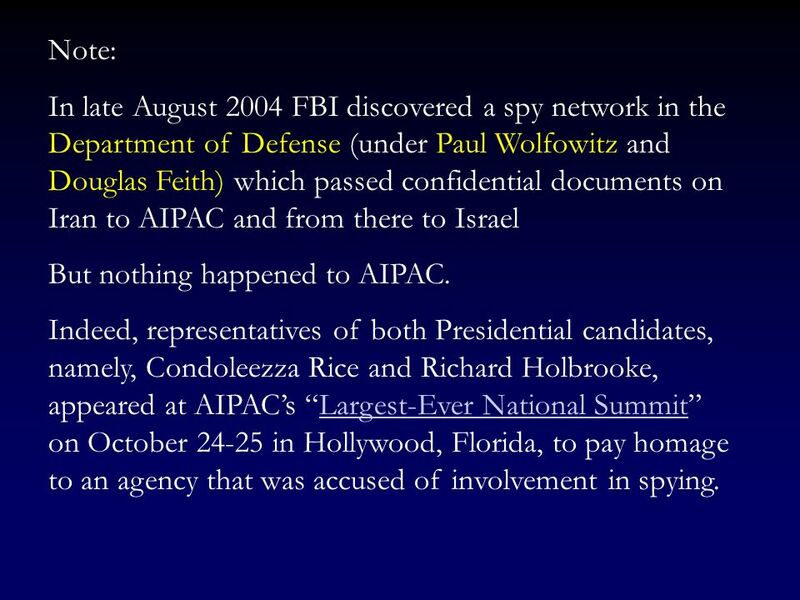 Indeed, representatives of both Presidential candidates, namely, Condoleezza Rice and Richard Holbrooke, appeared at AIPAC’s “Largest-Ever National Summit” on October in Hollywood, Florida, to pay homage to an agency that was accused of involvement in spying. 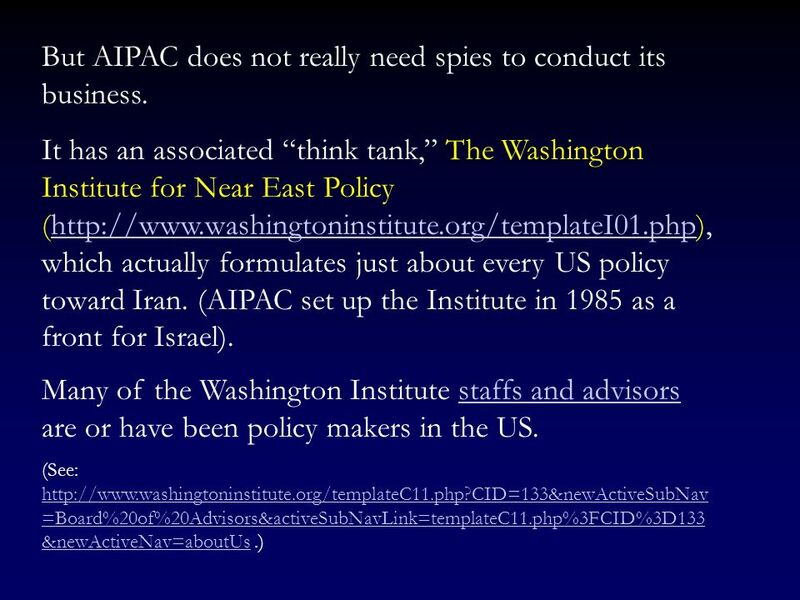 59 But AIPAC does not really need spies to conduct its business. 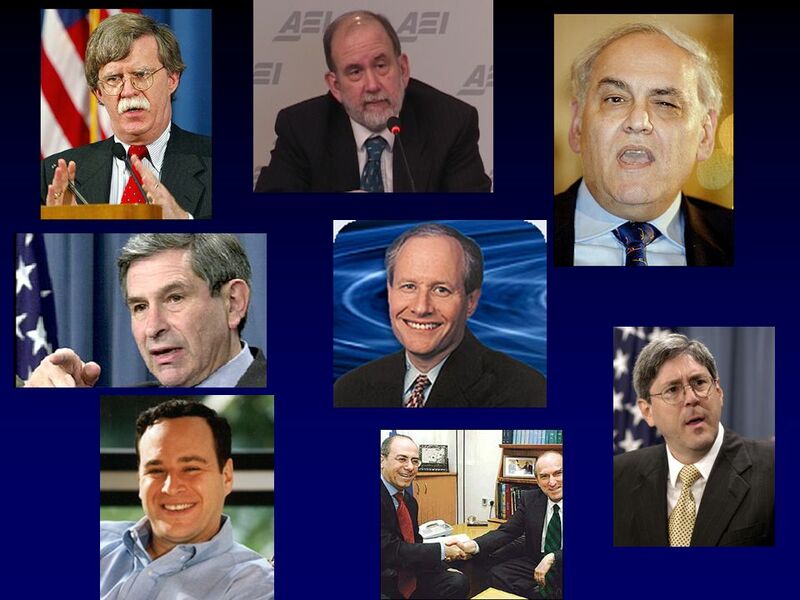 60 Since the early 1990s various factions in the Washington Institute have been working within the US administrations to shape the US policy toward Iran. 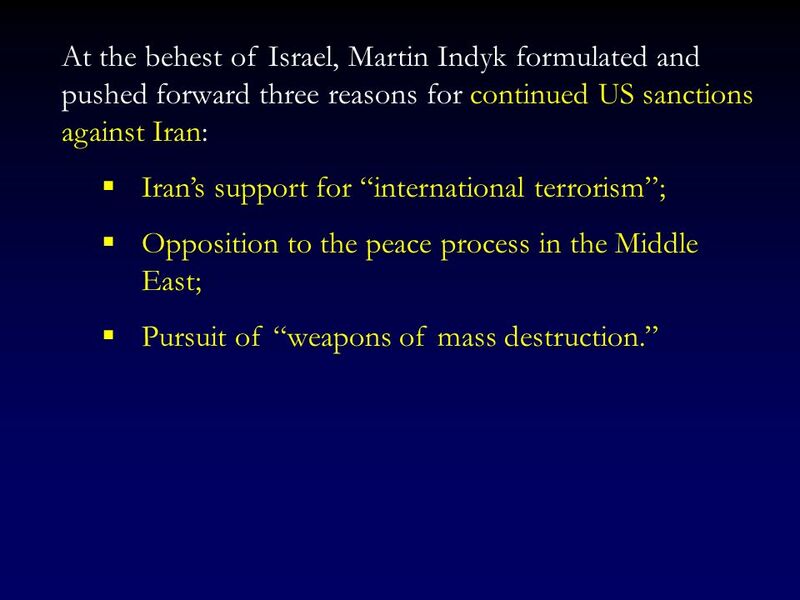 The first such individual was Martin Indyk. 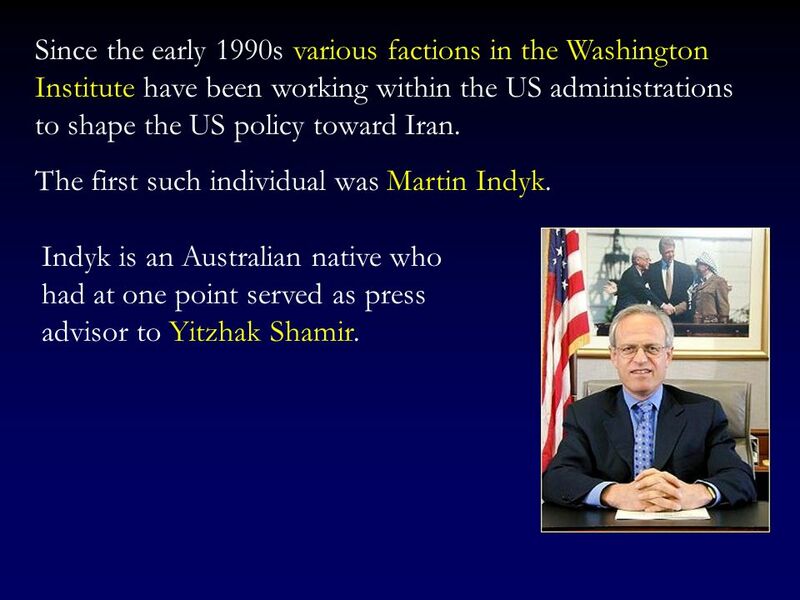 Indyk is an Australian native who had at one point served as press advisor to Yitzhak Shamir. 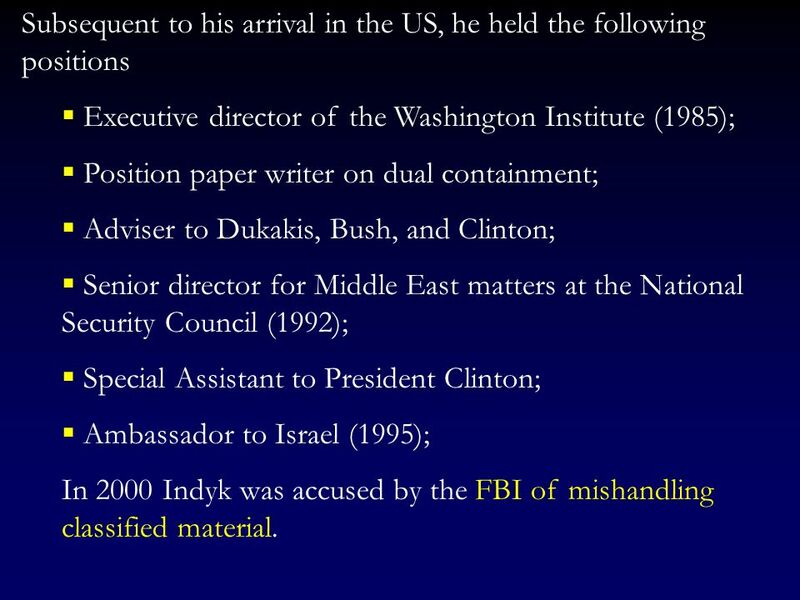 Executive director of the Washington Institute (1985); Position paper writer on dual containment; Adviser to Dukakis, Bush, and Clinton; Senior director for Middle East matters at the National Security Council (1992); Special Assistant to President Clinton; Ambassador to Israel (1995); In 2000 Indyk was accused by the FBI of mishandling classified material. 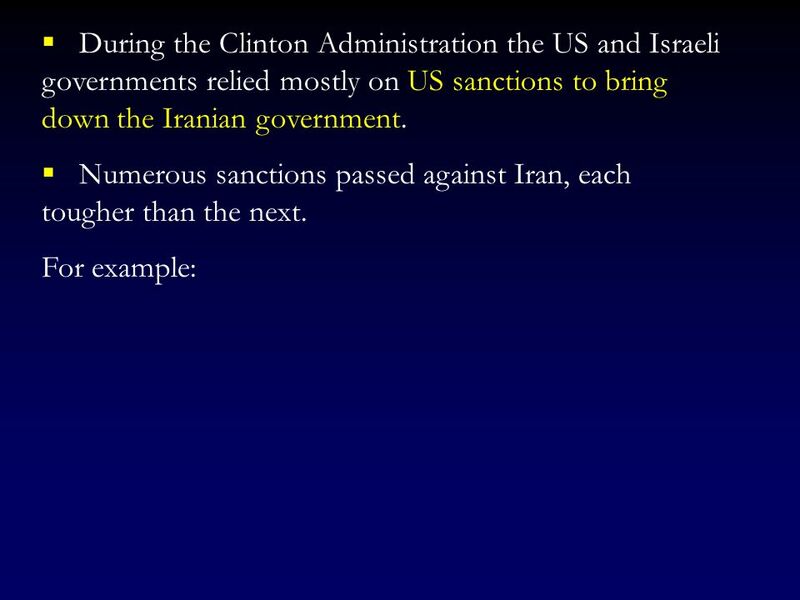 63 These three accusations have been used by both the Clinton and the current administration in order to overthrow the Iranian government and replace it with a US-Israeli friendly one. The difference between the policies of the two administrations are as follows. 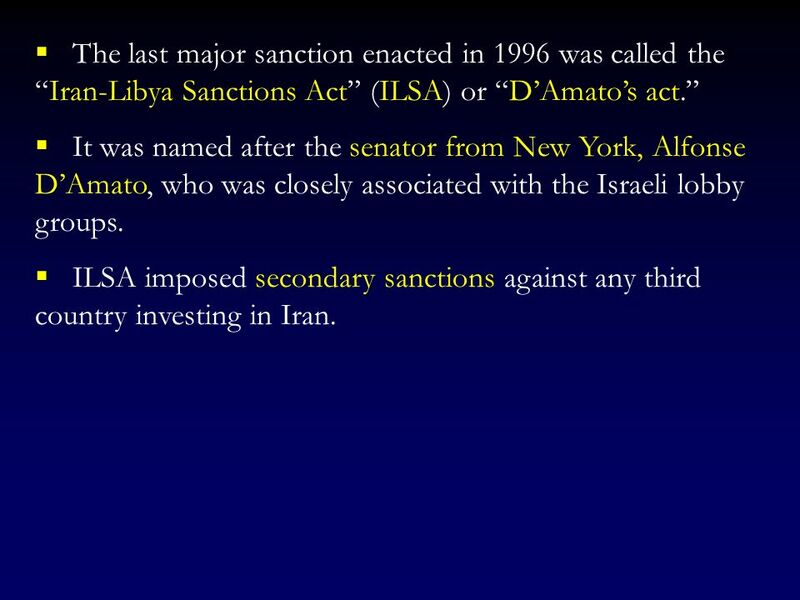 67 The last major sanction enacted in 1996 was called the “Iran-Libya Sanctions Act” (ILSA) or “D’Amato’s act.” It was named after the senator from New York, Alfonse D’Amato, who was closely associated with the Israeli lobby groups. ILSA imposed secondary sanctions against any third country investing in Iran. 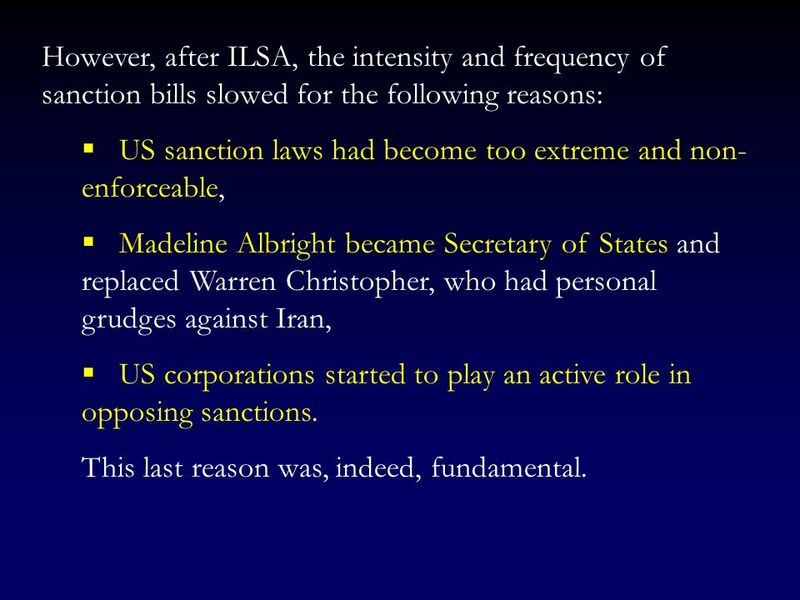 US sanction laws had become too extreme and non-enforceable, Madeline Albright became Secretary of States and replaced Warren Christopher, who had personal grudges against Iran, US corporations started to play an active role in opposing sanctions. This last reason was, indeed, fundamental. 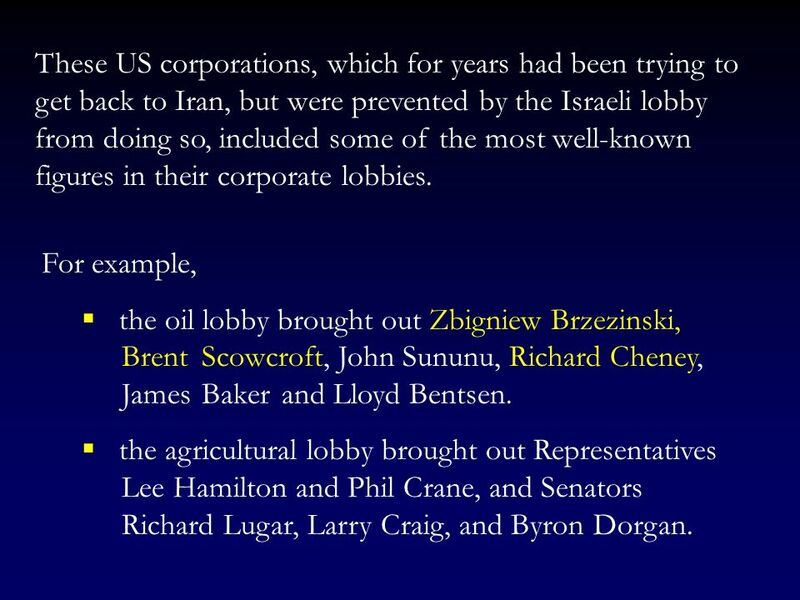 69 These US corporations, which for years had been trying to get back to Iran, but were prevented by the Israeli lobby from doing so, included some of the most well-known figures in their corporate lobbies. 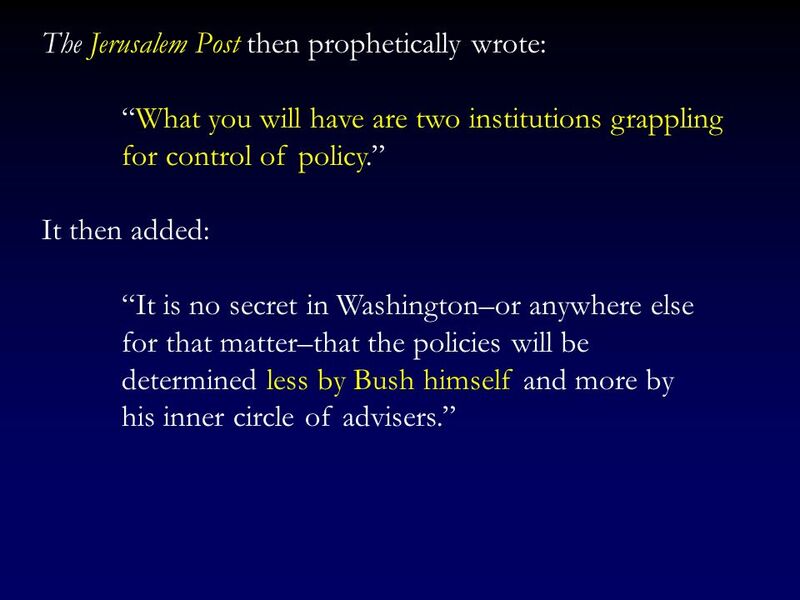 For example, the oil lobby brought out Zbigniew Brzezinski, Brent Scowcroft, John Sununu, Richard Cheney, James Baker and Lloyd Bentsen. the agricultural lobby brought out Representatives Lee Hamilton and Phil Crane, and Senators Richard Lugar, Larry Craig, and Byron Dorgan. 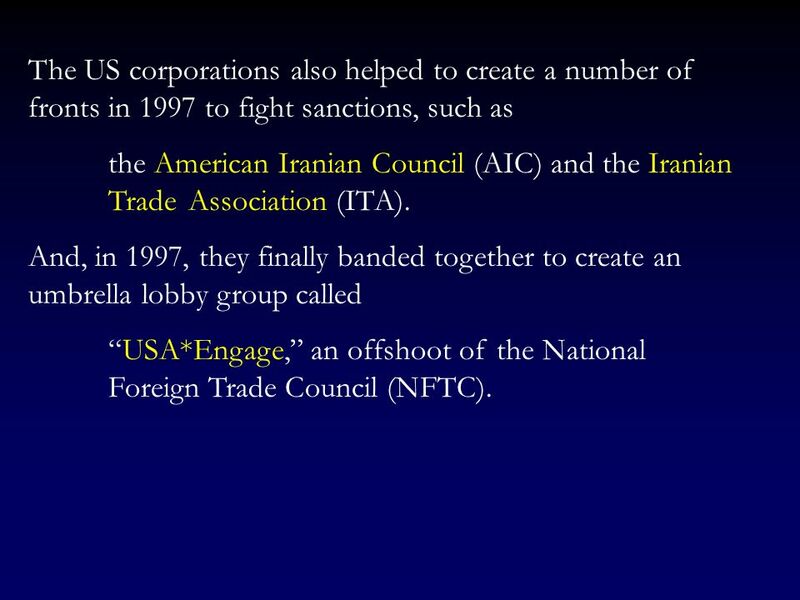 the American Iranian Council (AIC) and the Iranian Trade Association (ITA). 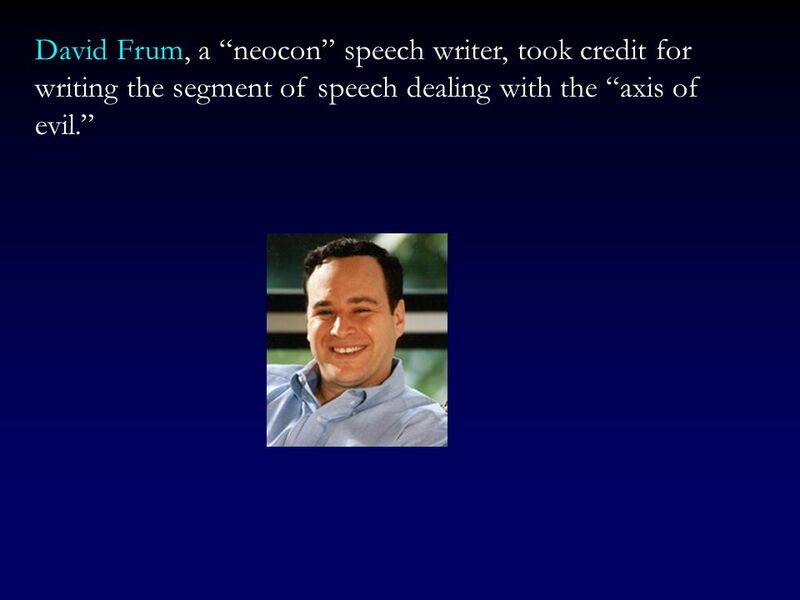 And, in 1997, they finally banded together to create an umbrella lobby group called “USA*Engage,” an offshoot of the National Foreign Trade Council (NFTC). 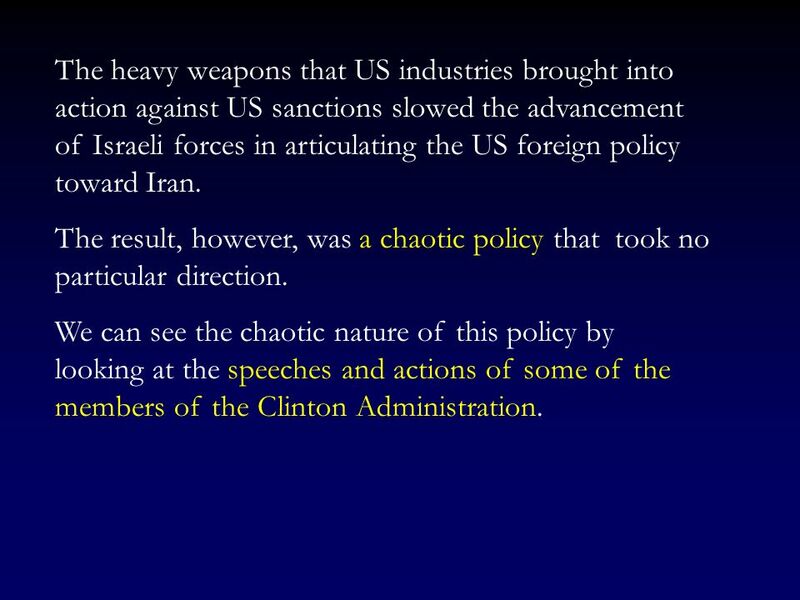 71 The heavy weapons that US industries brought into action against US sanctions slowed the advancement of Israeli forces in articulating the US foreign policy toward Iran. 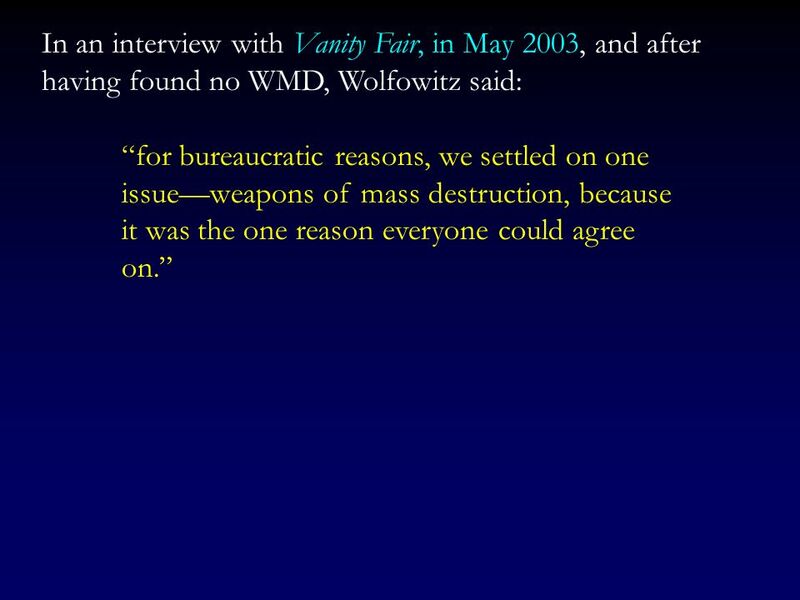 The result, however, was a chaotic policy that took no particular direction. 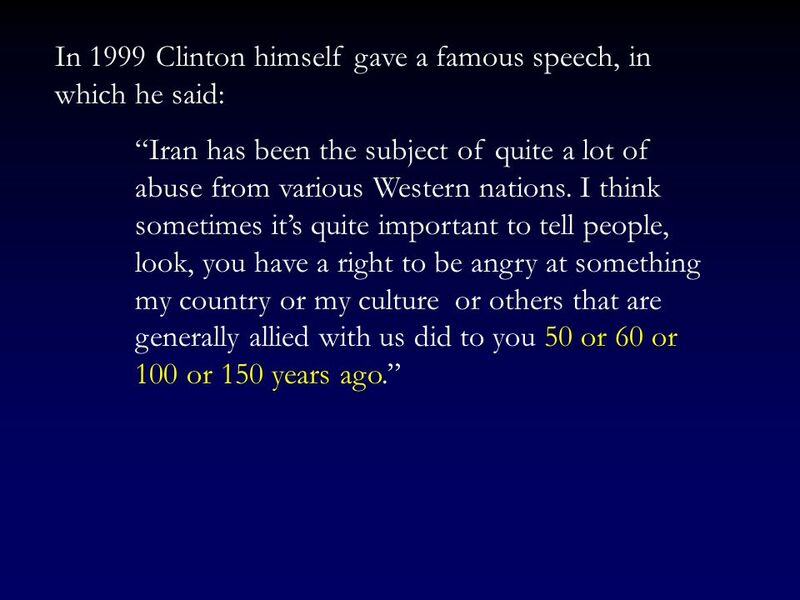 We can see the chaotic nature of this policy by looking at the speeches and actions of some of the members of the Clinton Administration. 73 I feel your pain! 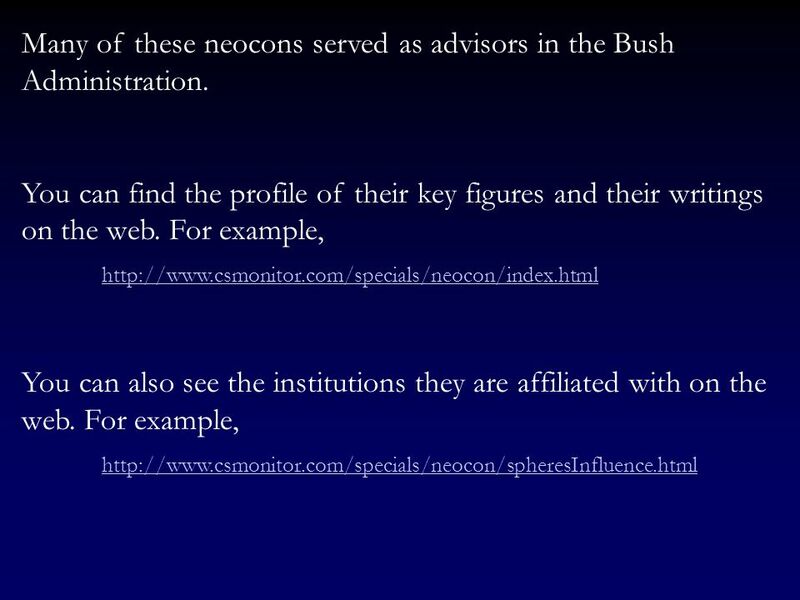 79 Many of these neocons served as advisors in the Bush Administration. 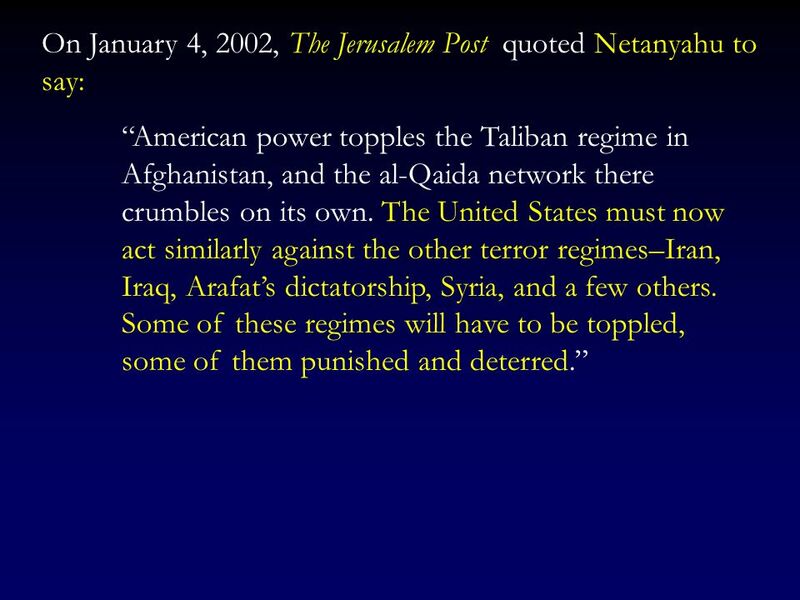 84 The Jerusalem Post was right! 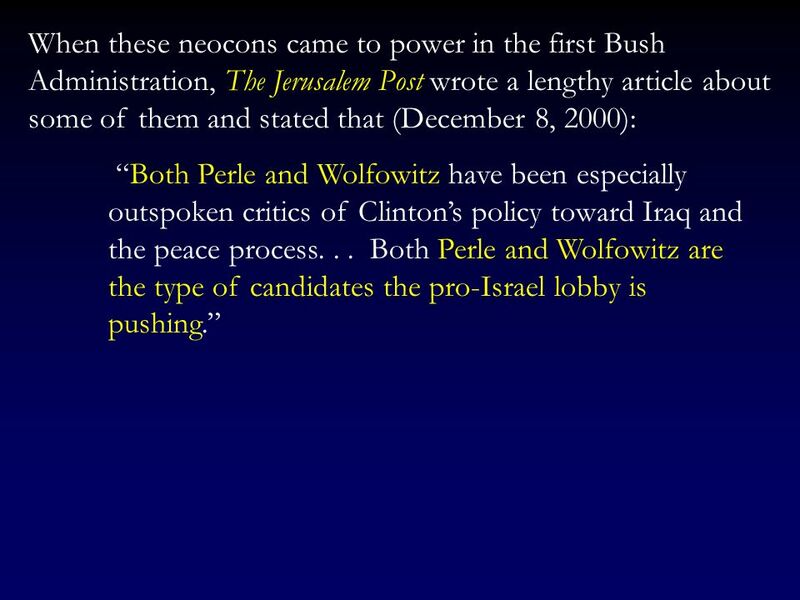 Neocons, such as Richard Perle, Paul Wolfowitz, Douglas Feith, John Bolton, etc. 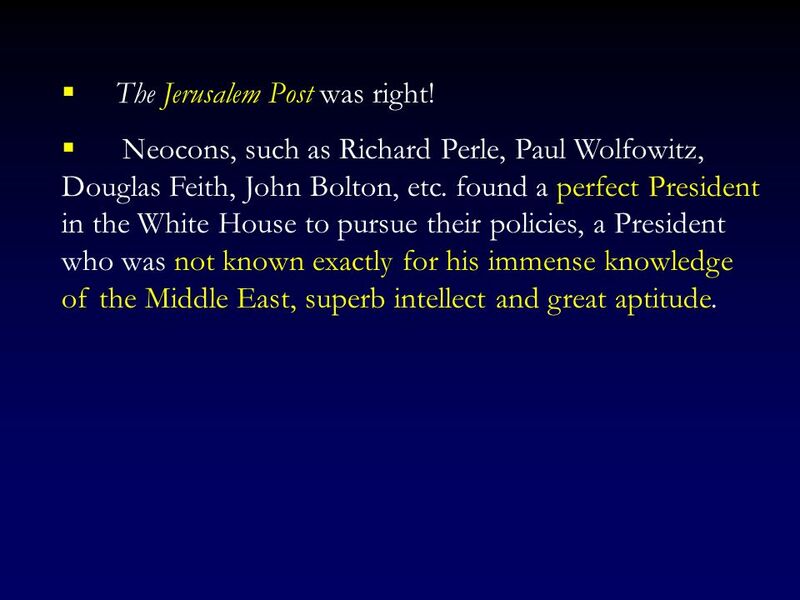 found a perfect President in the White House to pursue their policies, a President who was not known exactly for his immense knowledge of the Middle East, superb intellect and great aptitude. 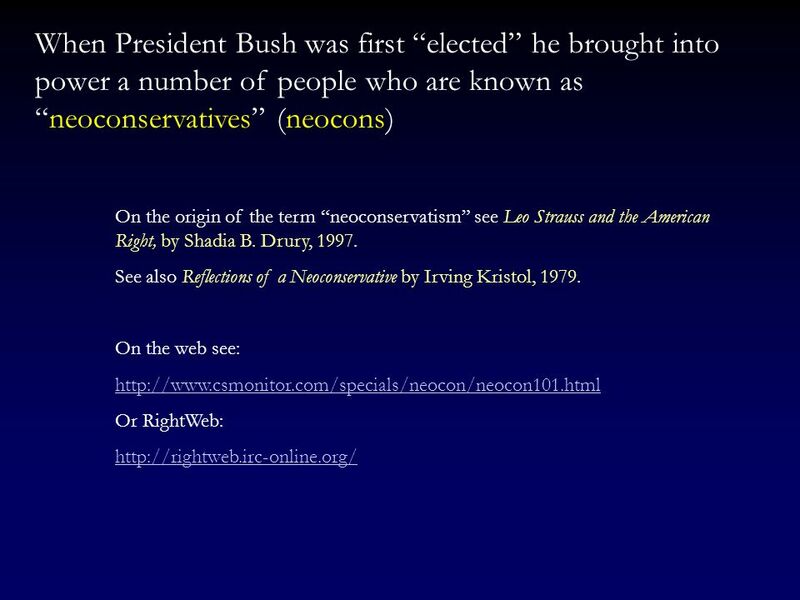 88 Q: How were the policies of the neocons different than the policies of those who came before them? 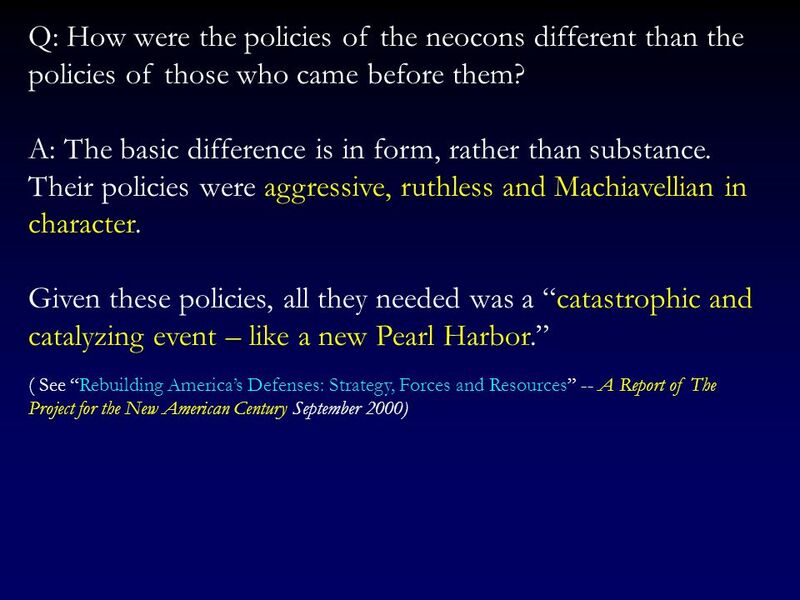 90 9/11 gave the “neocons” a perfect opportunity to carry on their policies. 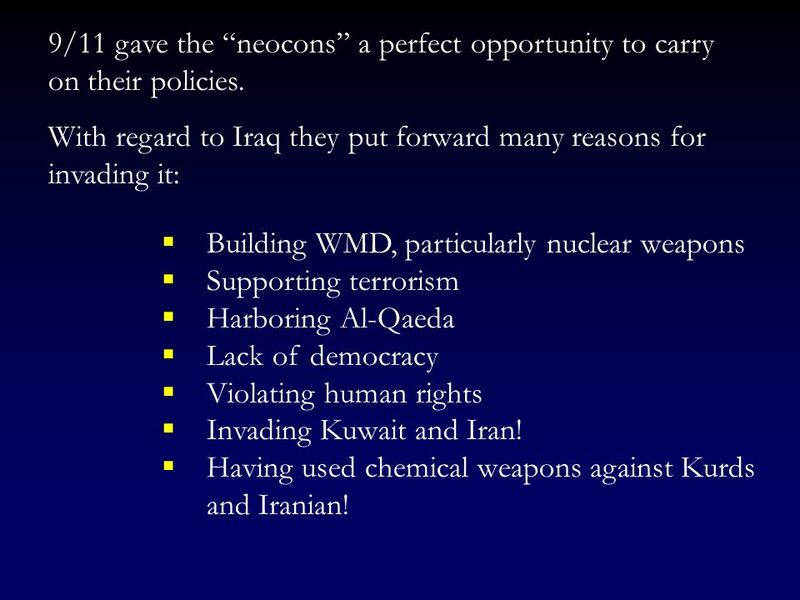 With regard to Iraq they put forward many reasons for invading it: Building WMD, particularly nuclear weapons Supporting terrorism Harboring Al-Qaeda Lack of democracy Violating human rights Invading Kuwait and Iran! 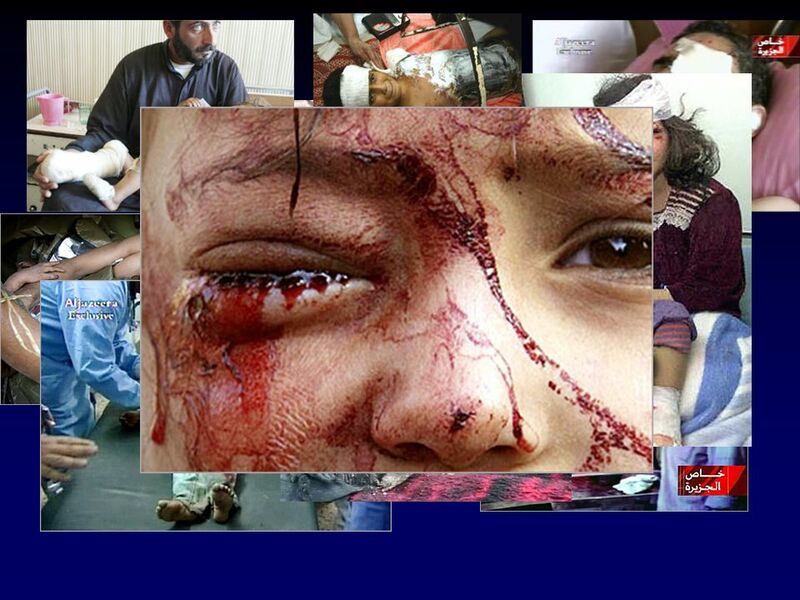 Having used chemical weapons against Kurds and Iranian! 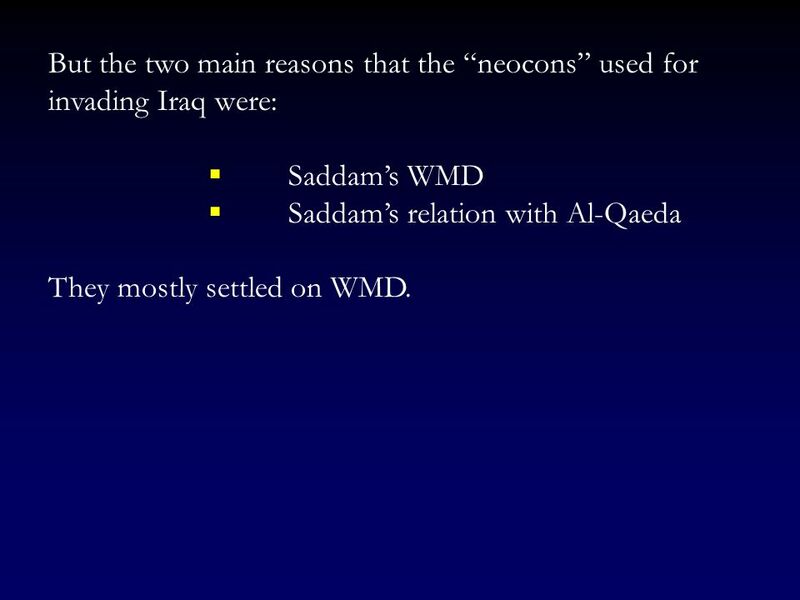 Saddam’s WMD Saddam’s relation with Al-Qaeda They mostly settled on WMD. 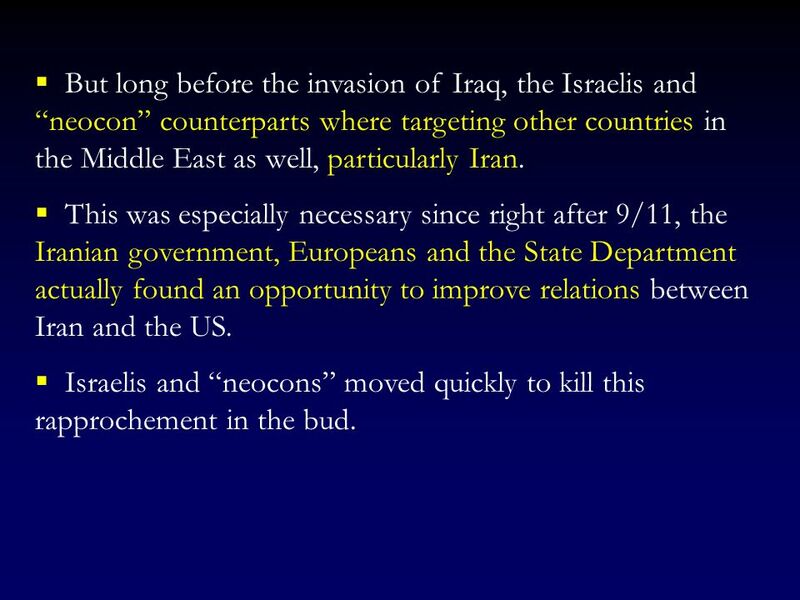 96 But long before the invasion of Iraq, the Israelis and “neocon” counterparts where targeting other countries in the Middle East as well, particularly Iran. 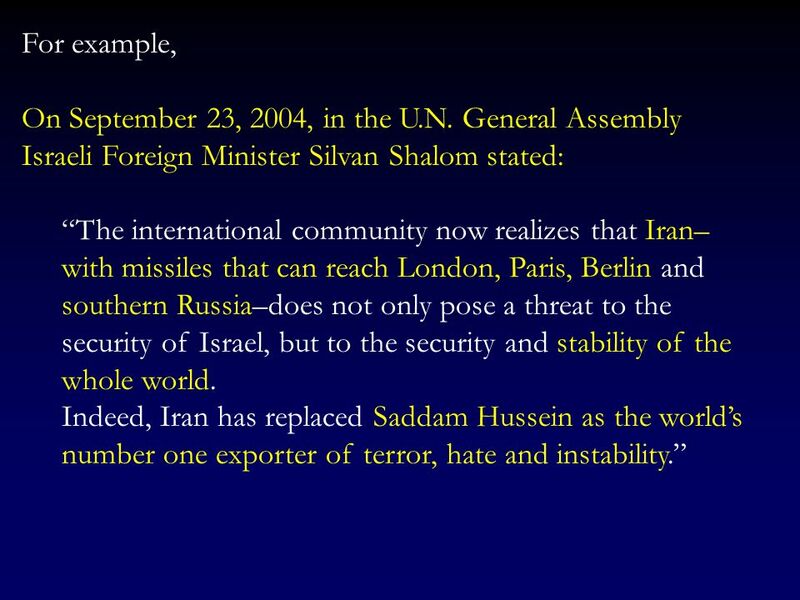 This was especially necessary since right after 9/11, the Iranian government, Europeans and the State Department actually found an opportunity to improve relations between Iran and the US. 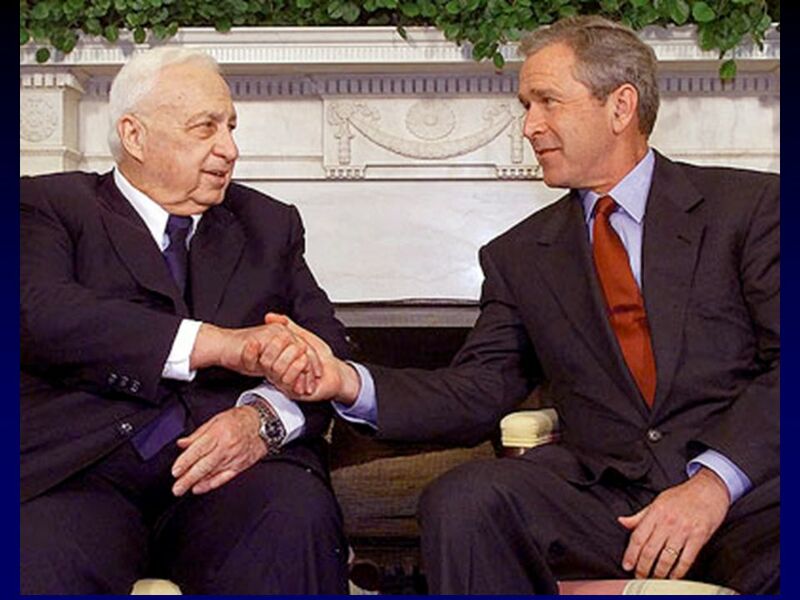 Israelis and “neocons” moved quickly to kill this rapprochement in the bud. 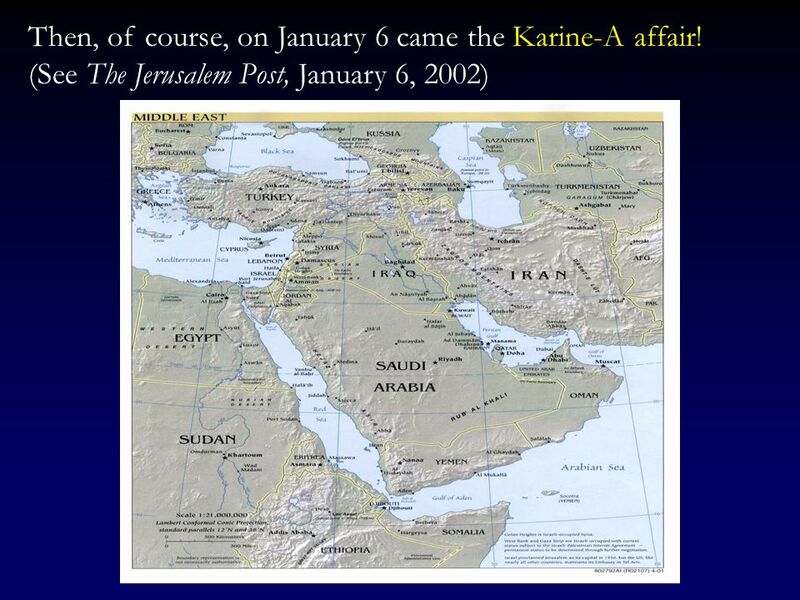 101 Then, of course, on January 6 came the Karine-A affair! 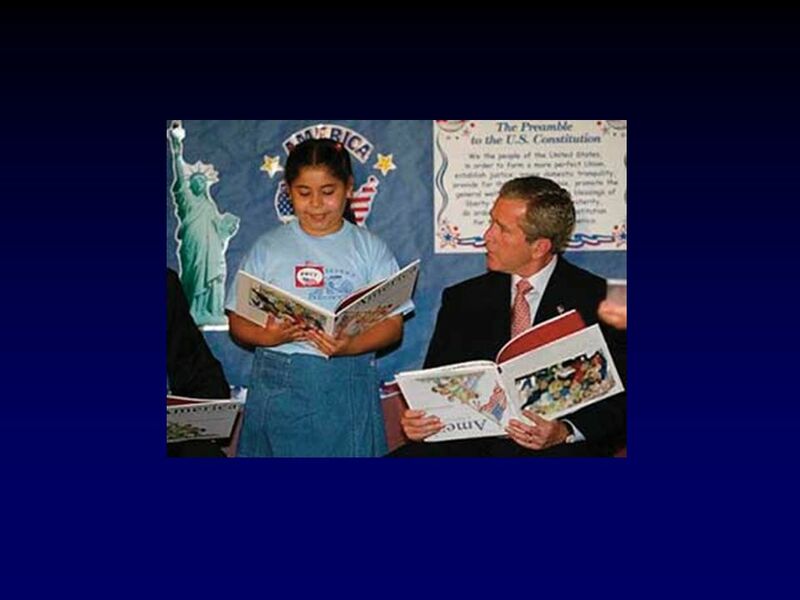 104 The 2002 State of the Union Address made it clear who had the President’s ear. 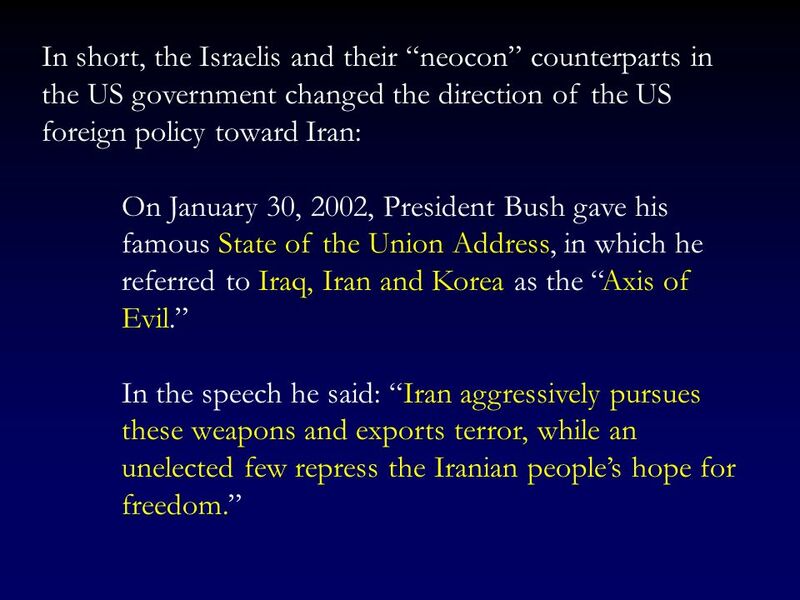 The “neocons” and the Israelis were now in full charge of the US policy towards Iran. 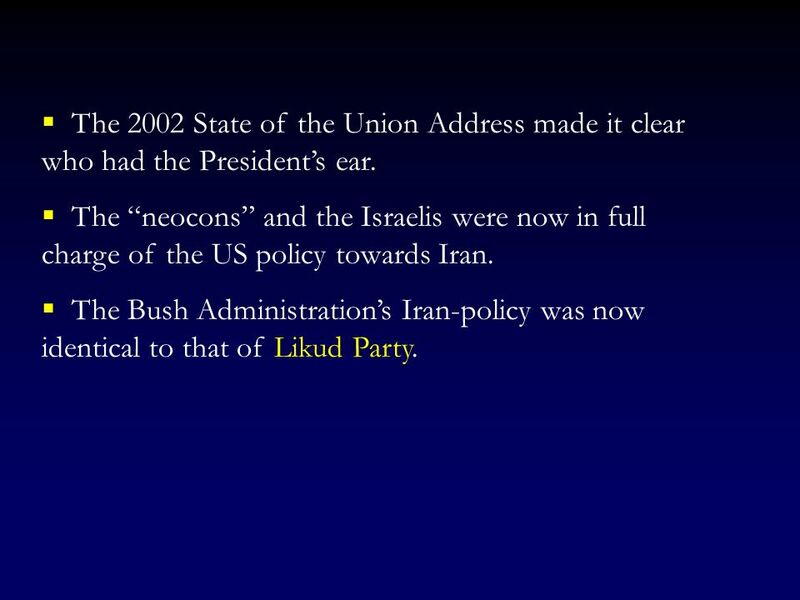 The Bush Administration’s Iran-policy was now identical to that of Likud Party. 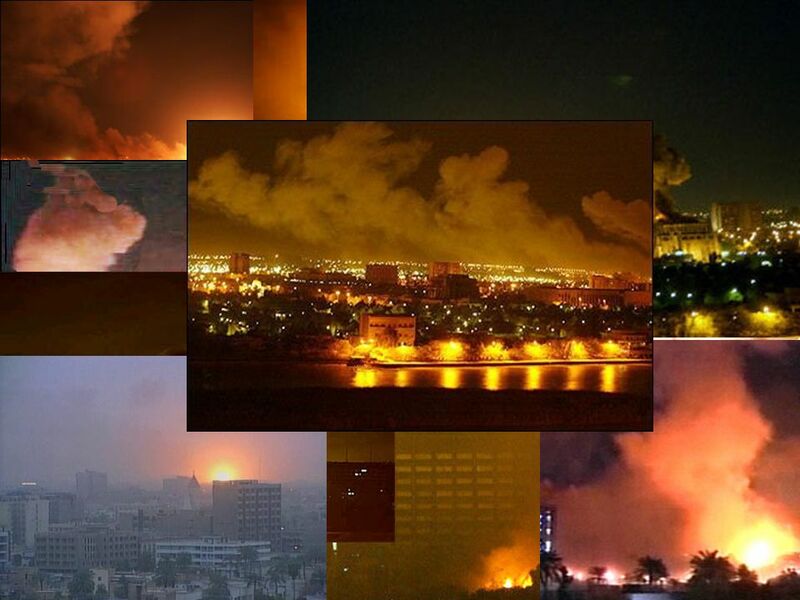 106 A campaign now began to do to Iran what had been done to Iraq. 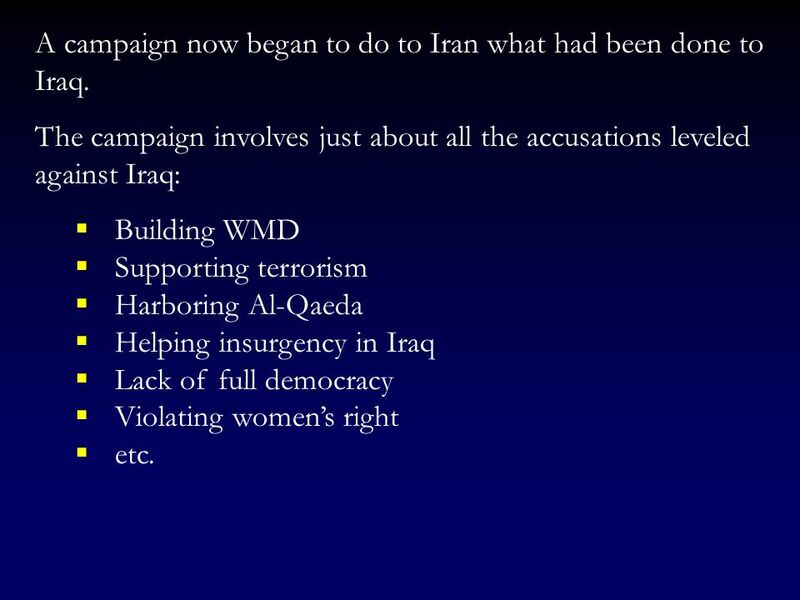 The campaign involves just about all the accusations leveled against Iraq: Building WMD Supporting terrorism Harboring Al-Qaeda Helping insurgency in Iraq Lack of full democracy Violating women’s right etc. 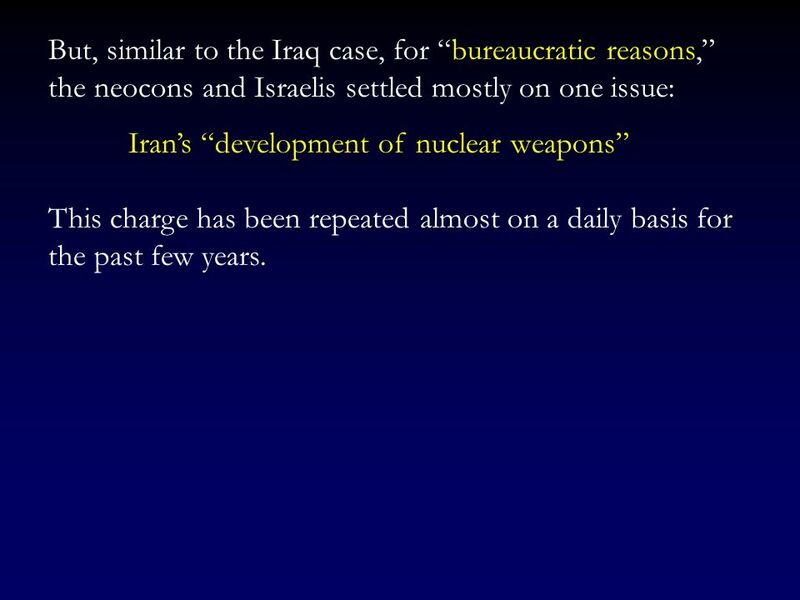 107 But, similar to the Iraq case, for “bureaucratic reasons,” the neocons and Israelis settled mostly on one issue: Iran’s “development of nuclear weapons” This charge has been repeated almost on a daily basis for the past few years. 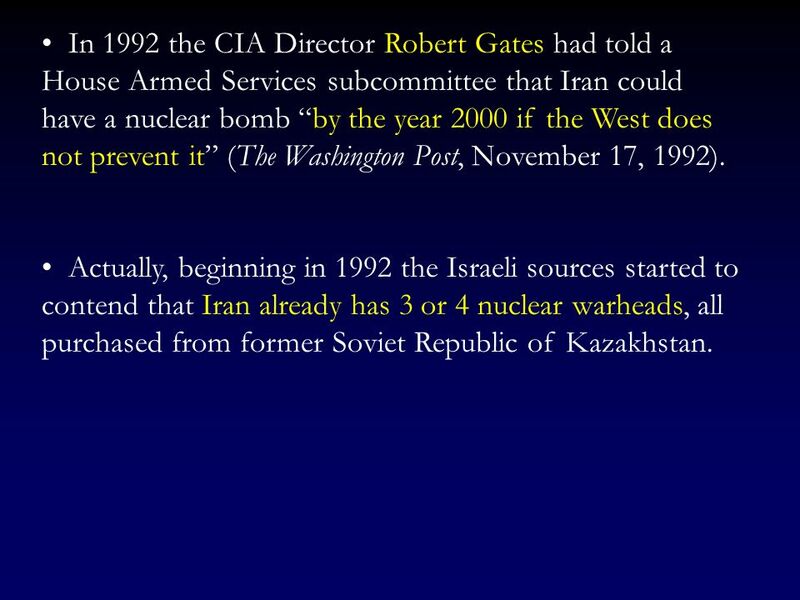 109 In 1992 the CIA Director Robert Gates had told a House Armed Services subcommittee that Iran could have a nuclear bomb “by the year 2000 if the West does not prevent it” (The Washington Post, November 17, 1992). 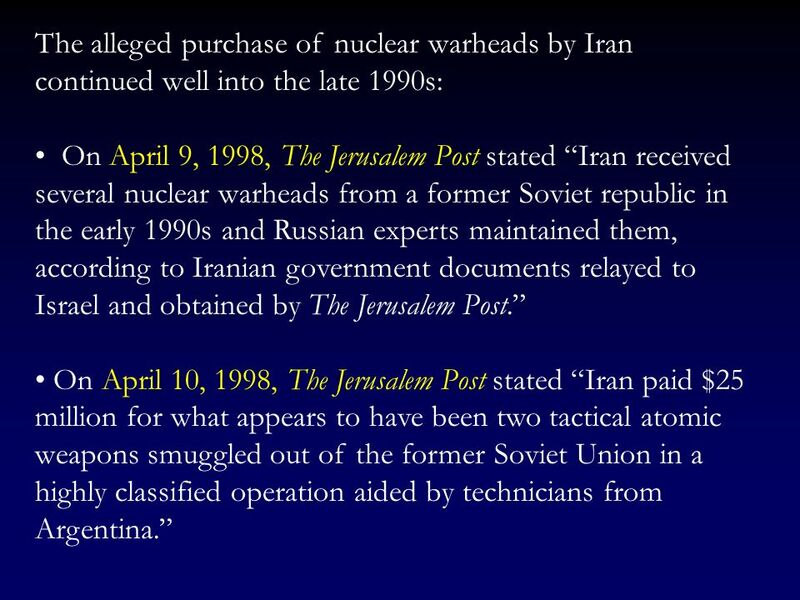 Actually, beginning in 1992 the Israeli sources started to contend that Iran already has 3 or 4 nuclear warheads, all purchased from former Soviet Republic of Kazakhstan. 111 All such news were, of course, complete fabrication. 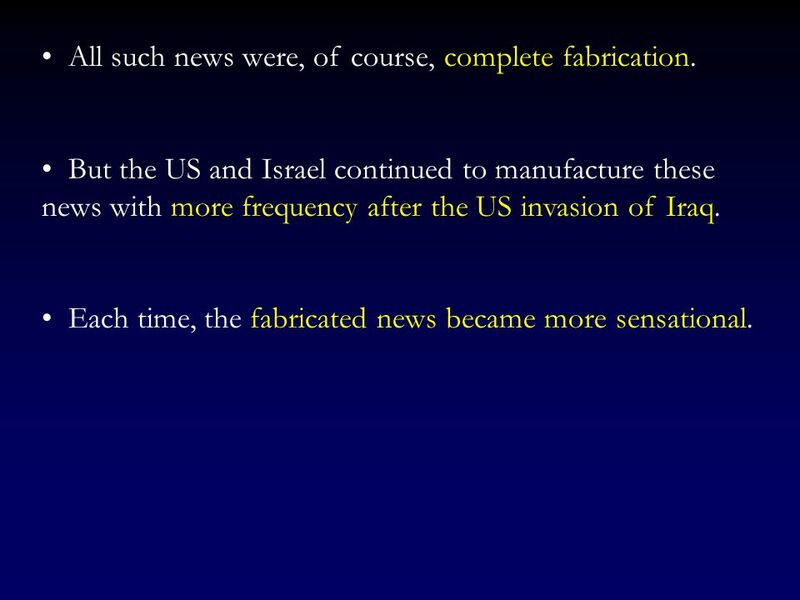 But the US and Israel continued to manufacture these news with more frequency after the US invasion of Iraq. Each time, the fabricated news became more sensational. 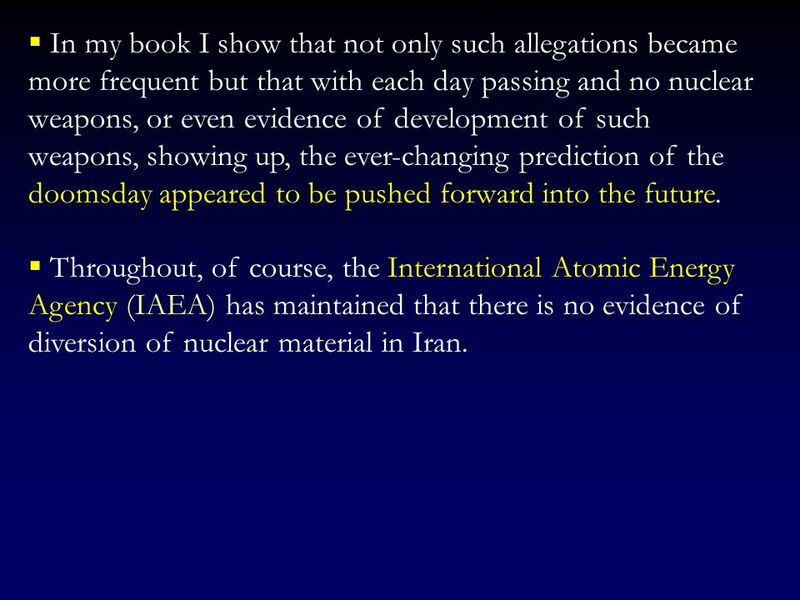 115 In my book I show that not only such allegations became more frequent but that with each day passing and no nuclear weapons, or even evidence of development of such weapons, showing up, the ever-changing prediction of the doomsday appeared to be pushed forward into the future. 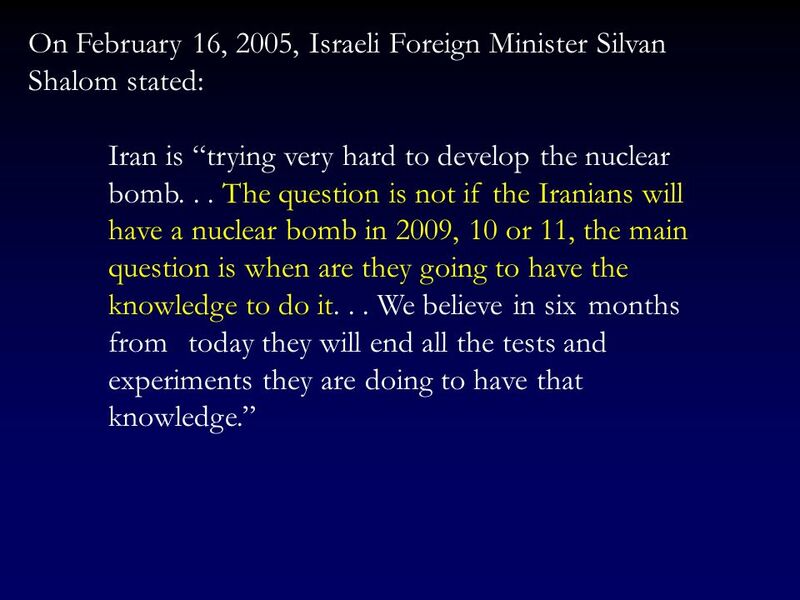 Throughout, of course, the International Atomic Energy Agency (IAEA) has maintained that there is no evidence of diversion of nuclear material in Iran. 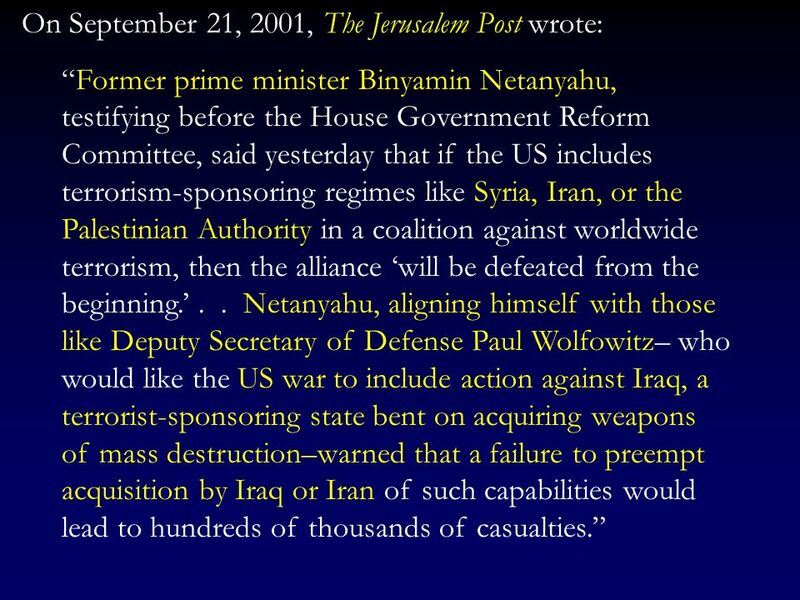 116 But the US and Israelis did not take no for an answer. 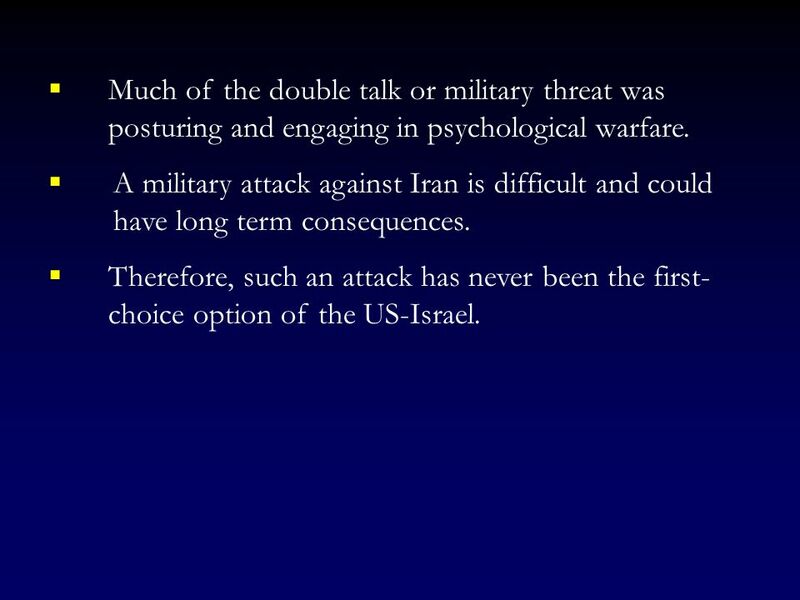 121 Much of the double talk or military threat was posturing and engaging in psychological warfare. 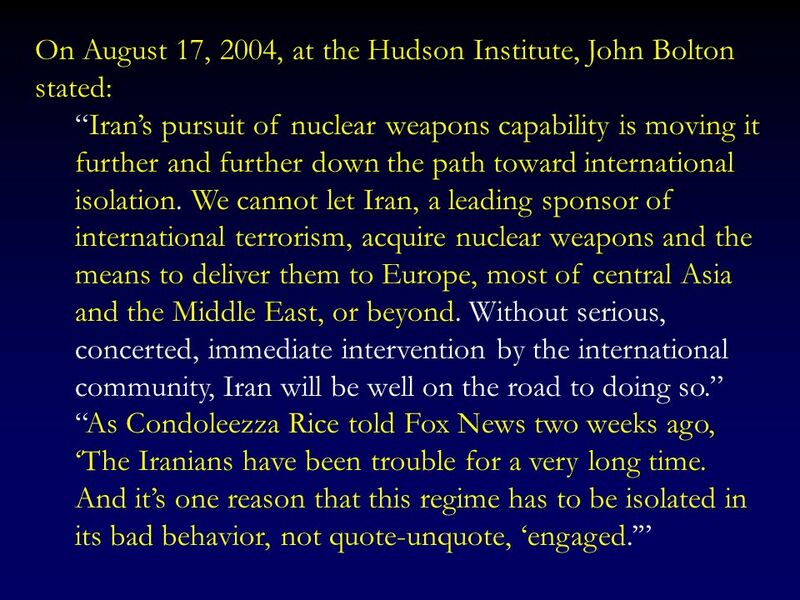 A military attack against Iran is difficult and could have long term consequences. 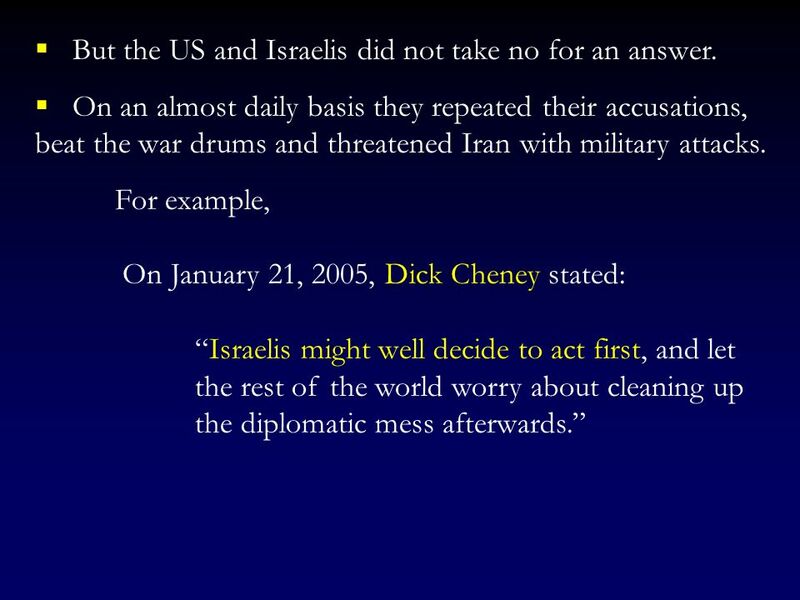 Therefore, such an attack has never been the first- choice option of the US-Israel. 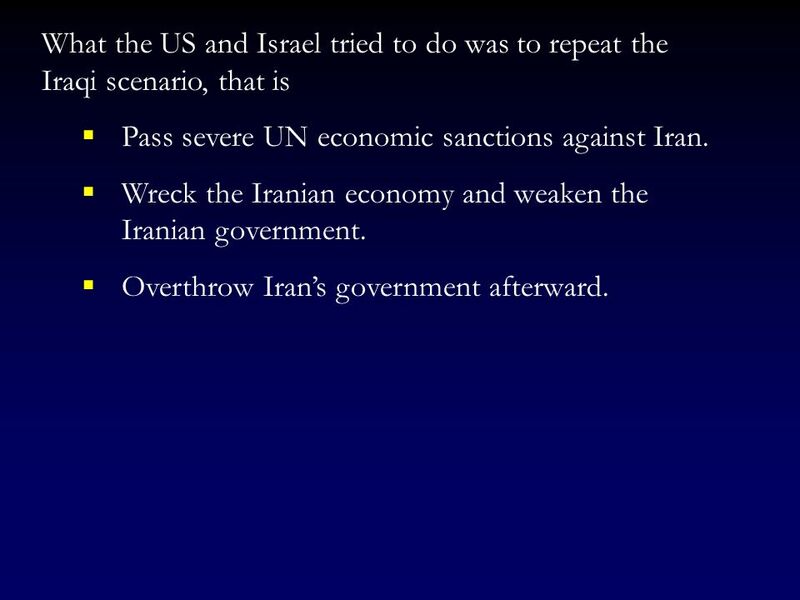 Pass severe UN economic sanctions against Iran. Wreck the Iranian economy and weaken the Iranian government. 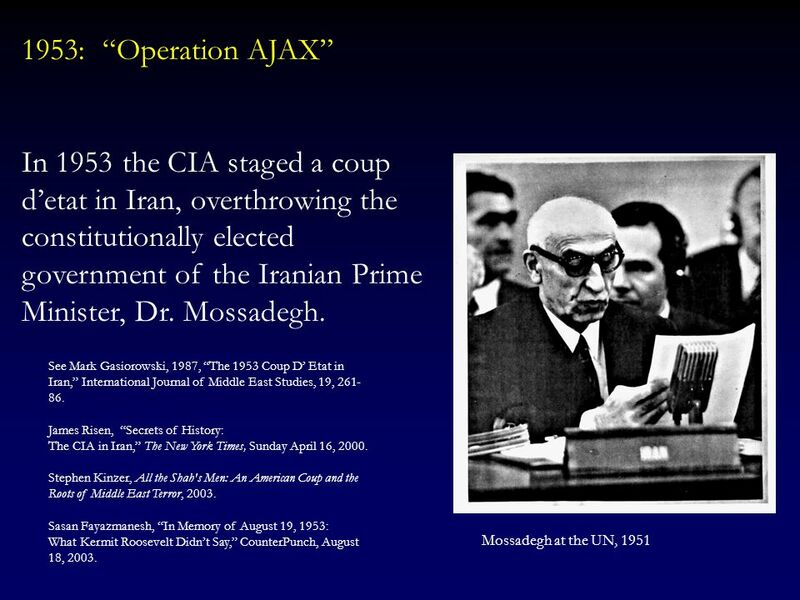 Overthrow Iran’s government afterward. 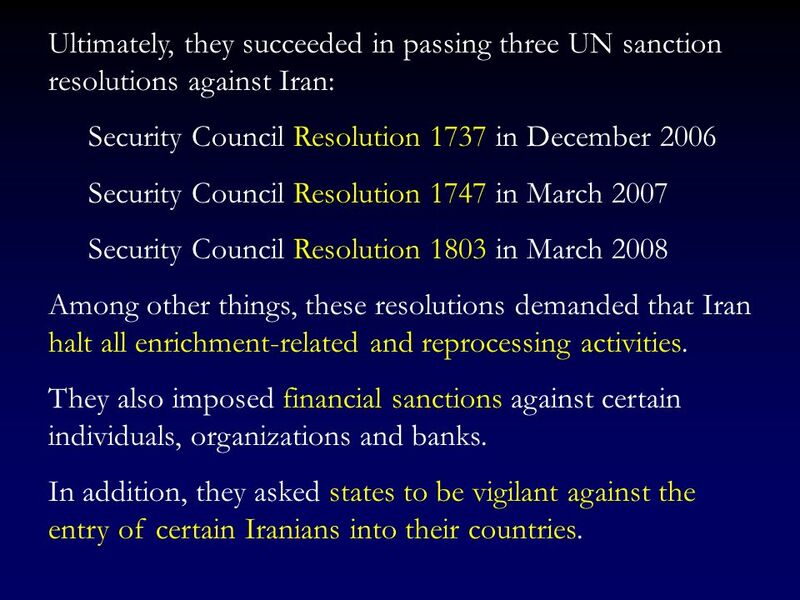 Security Council Resolution 1737 in December 2006 Security Council Resolution 1747 in March 2007 Security Council Resolution 1803 in March 2008 Among other things, these resolutions demanded that Iran halt all enrichment-related and reprocessing activities. They also imposed financial sanctions against certain individuals, organizations and banks. 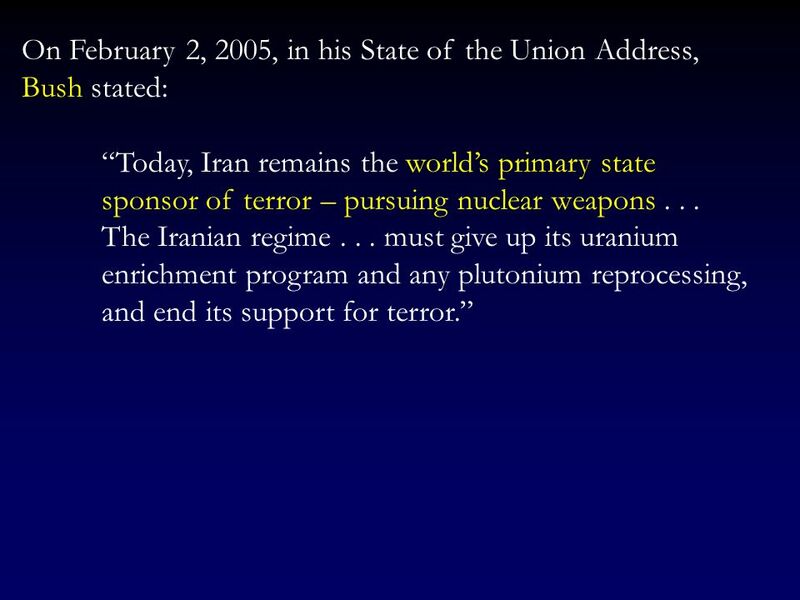 In addition, they asked states to be vigilant against the entry of certain Iranians into their countries. 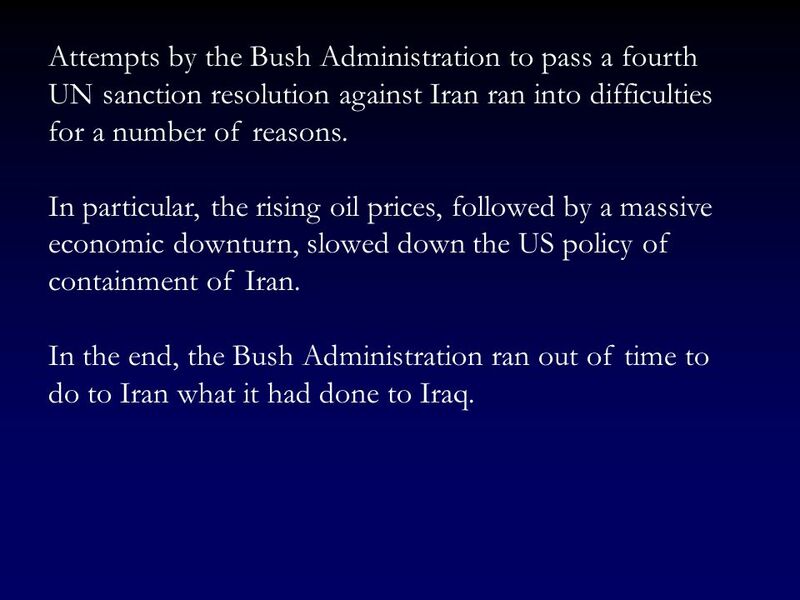 125 Attempts by the Bush Administration to pass a fourth UN sanction resolution against Iran ran into difficulties for a number of reasons. In particular, the rising oil prices, followed by a massive economic downturn, slowed down the US policy of containment of Iran. 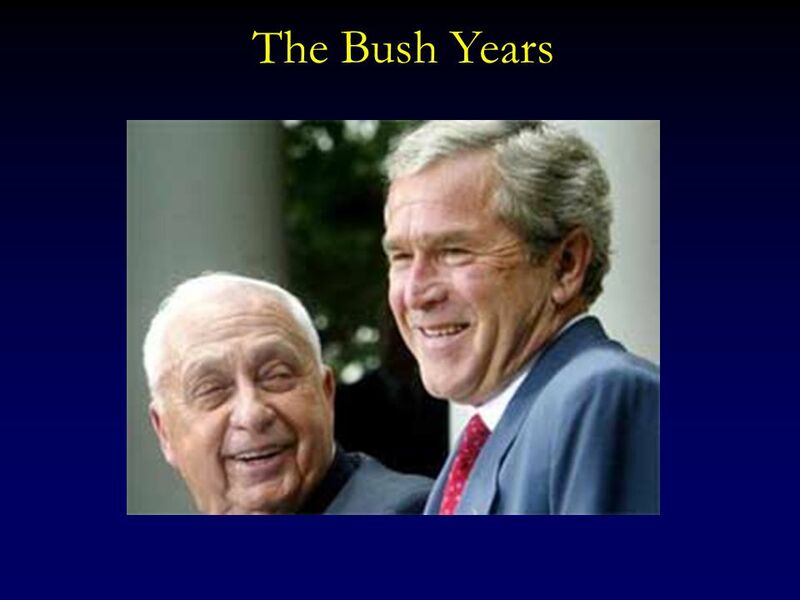 In the end, the Bush Administration ran out of time to do to Iran what it had done to Iraq. 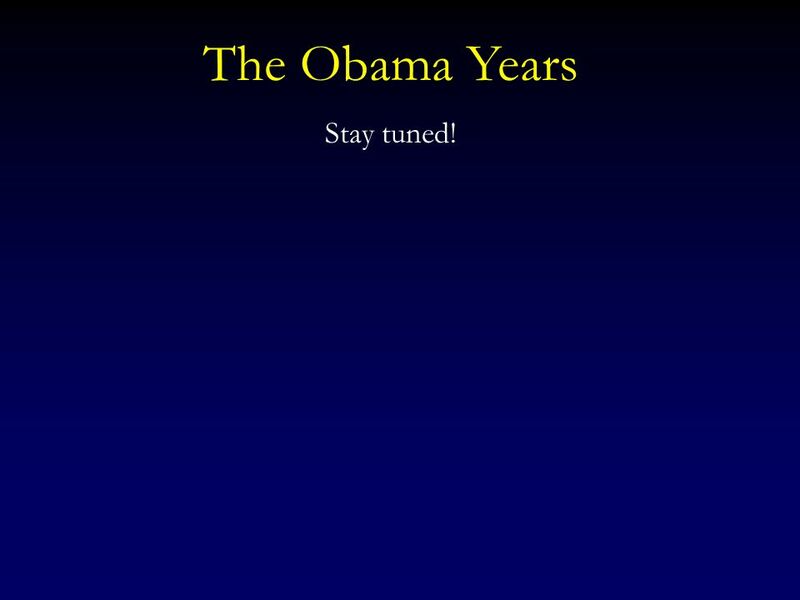 126 The Obama Years Stay tuned! 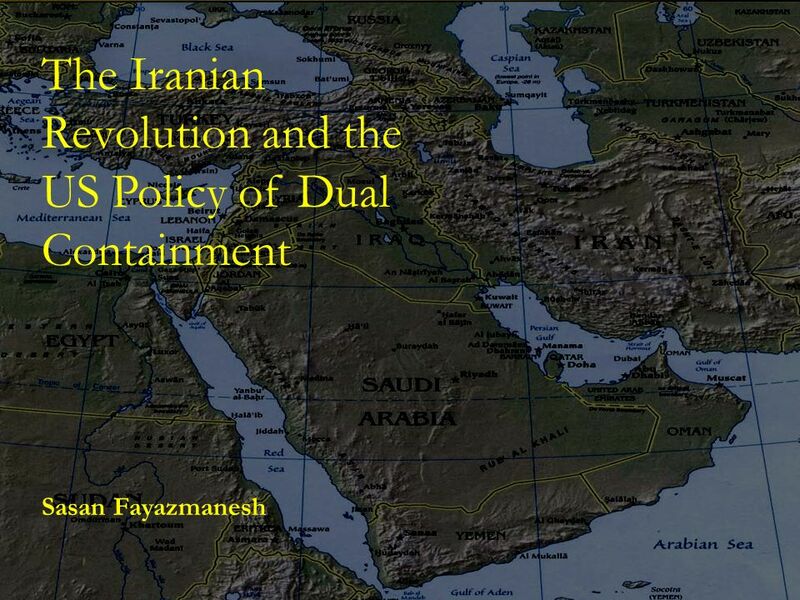 Download ppt "The Iranian Revolution and the US Policy of Dual Containment"
America at War: Examining Presidential Decision Making in Crisis Persian Gulf War: Issues and Decisions Jan. 16 to Feb. 27, 1991 Shirley Hammond. NATO – Credit level Exam Practice NATO in the exam Remember that NATO is an organisation concerned with military and defence issues. Do not discuss NATO. Chapter 21 Section 3 The Economic Crisis of the 1970s. 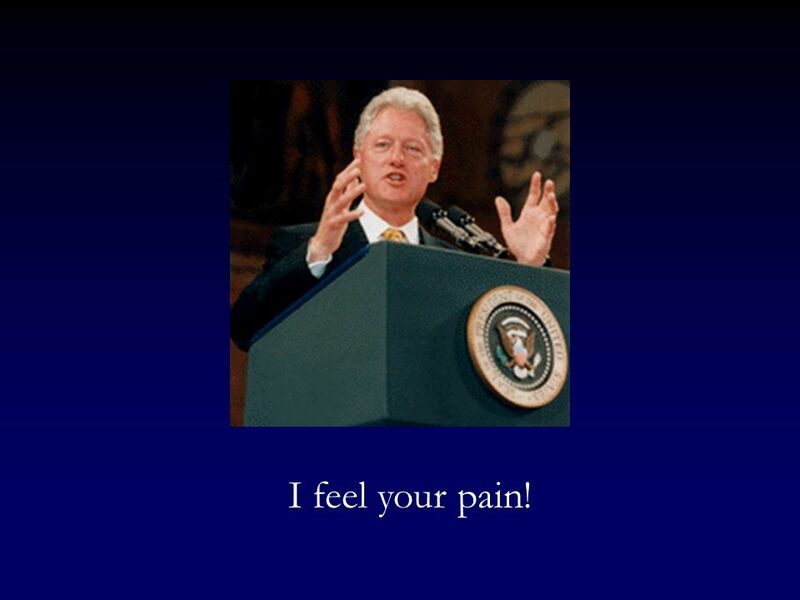 Everything Else Johnson’s Great Society Johnson’s Great Society Watergate Watergate Middle East Middle East Reaganomics Reaganomics Iran – Contra Iran. 1970s to OPEC- Organization of Petroleum Exporting Countries A cartel of nations that tries to control oil supply and production and thus controls. Listen to the different plans for peace in Palestine. Which one do you think is best? Tell me the plan and explain why you like it. 1 What will we learn. 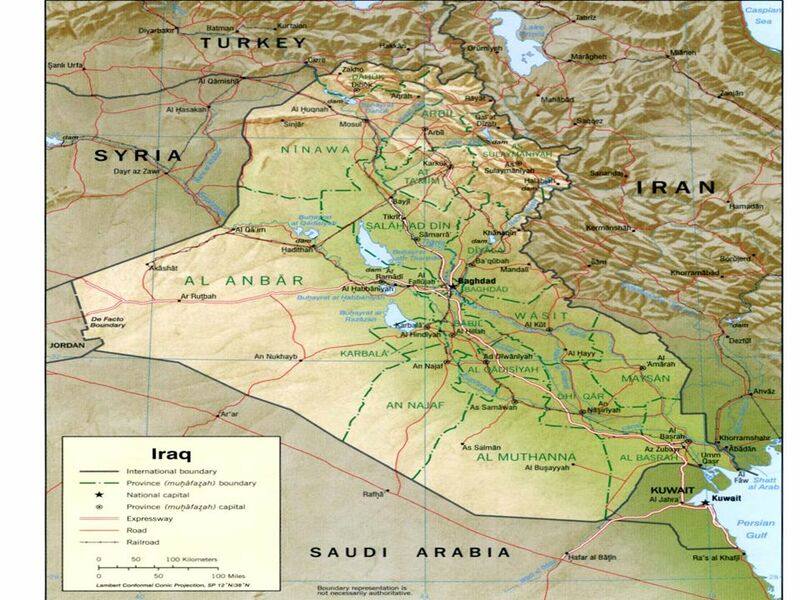 Who’s Who In The Iraq War?. 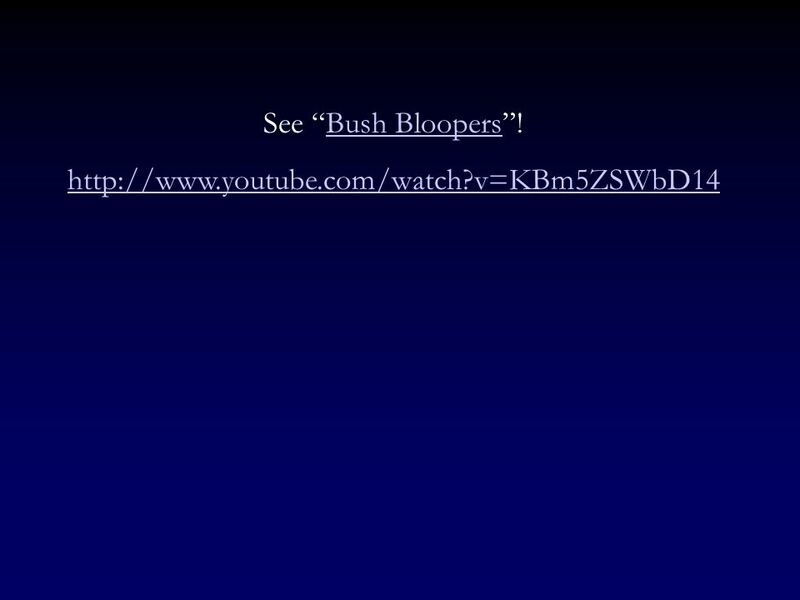 George W. Bush President of the United States, and Commander in Chief of US Military Forces Son of George H.W. 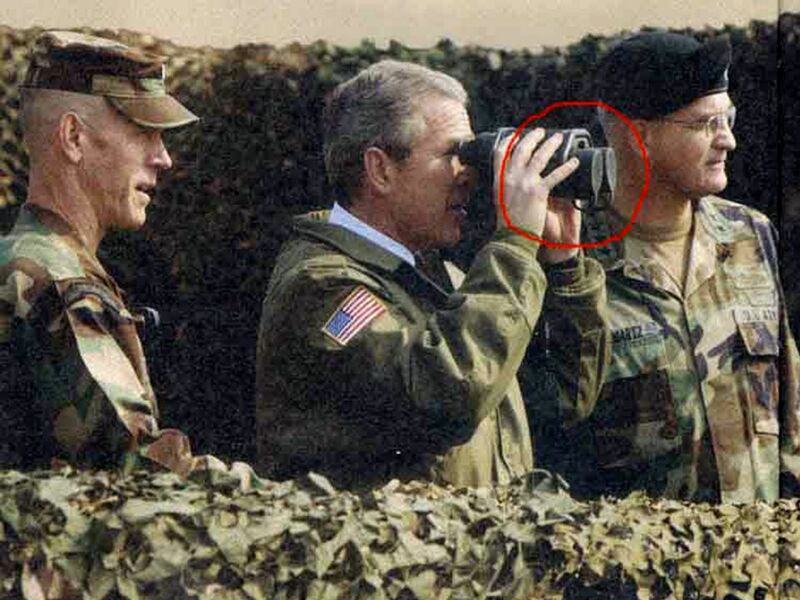 Bush, who served. 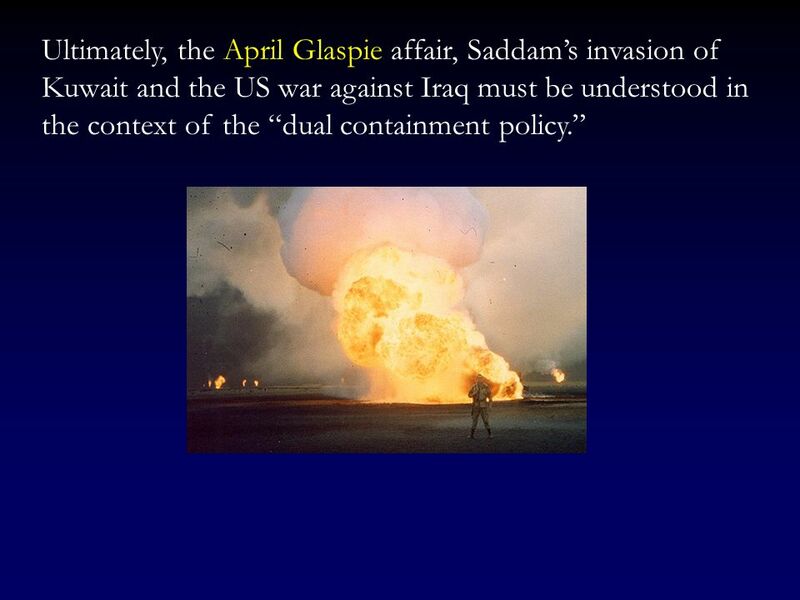 Overview Understand the causes, outcome and impact of Operation Desert Storm Understand how military aviation and national defense strategy fundamental. Today’s Agenda Attendance Notes on Afghanistan. Why is Iran so upset with America? 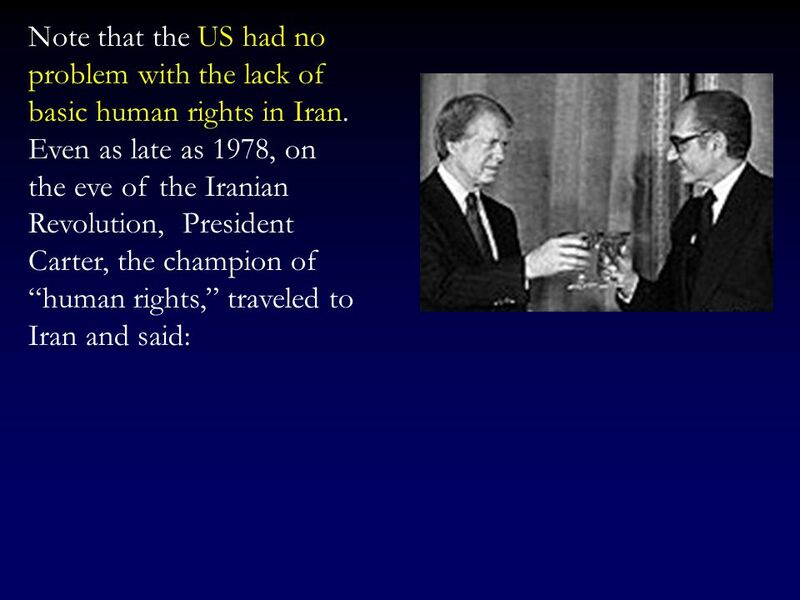 Iran and America’s relationship began around the 1900s when Iran began. Global Issues American Ideals All “men” created equal Equal Justice Under the Law Knowledge is Power Individualism Power of Gov’t rests in hands of people. 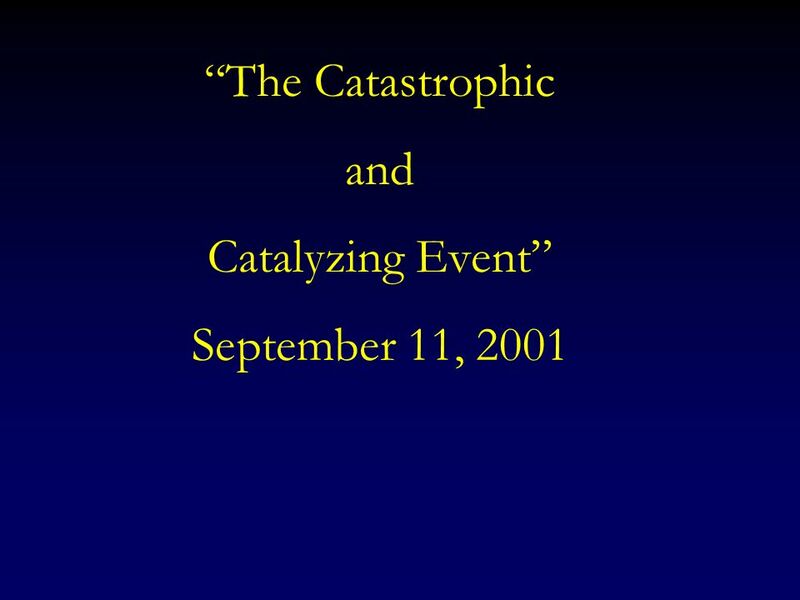 How September 11, 2001, Changed America Lesson 33-3 The Main Idea A horrific attack on September 11, 2001, awakened the nation to the threat of terrorism. U.S. Foreign Policy. What is “ foreign policy ” Goals that nations pursue in relation to other international actors –Goals Survival Territorial Integrity. In the Post World War II World. 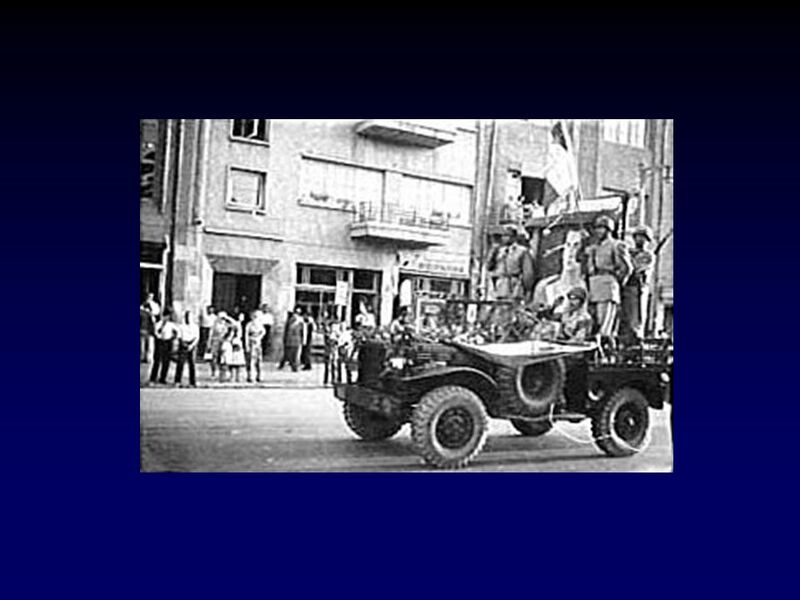 During and after World War II many Jews immigrated to Palestine During and after World War II many Jews immigrated to.